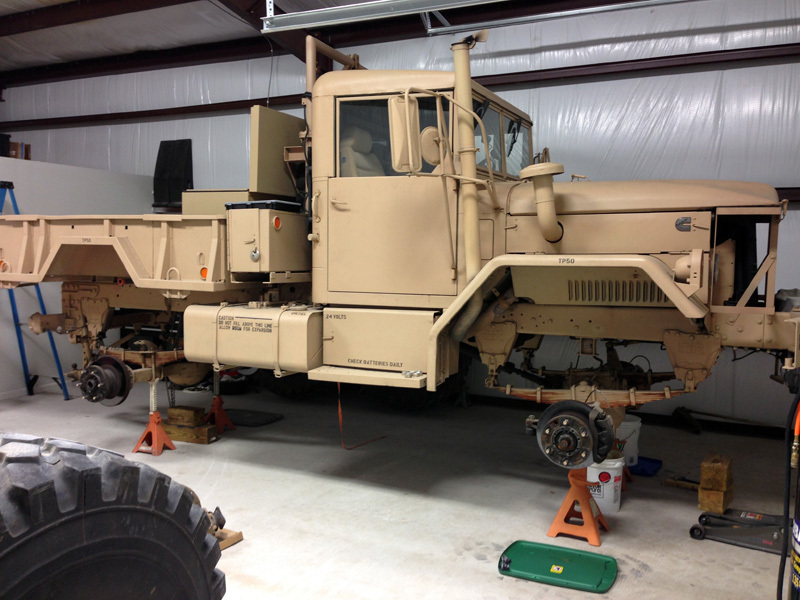 Due to work obligations I put my bobbed deuce in storage right after the 2016 Louisiana Flood without performing any type of maintenance or inspection. I knew this would cause consequences to my wallet. 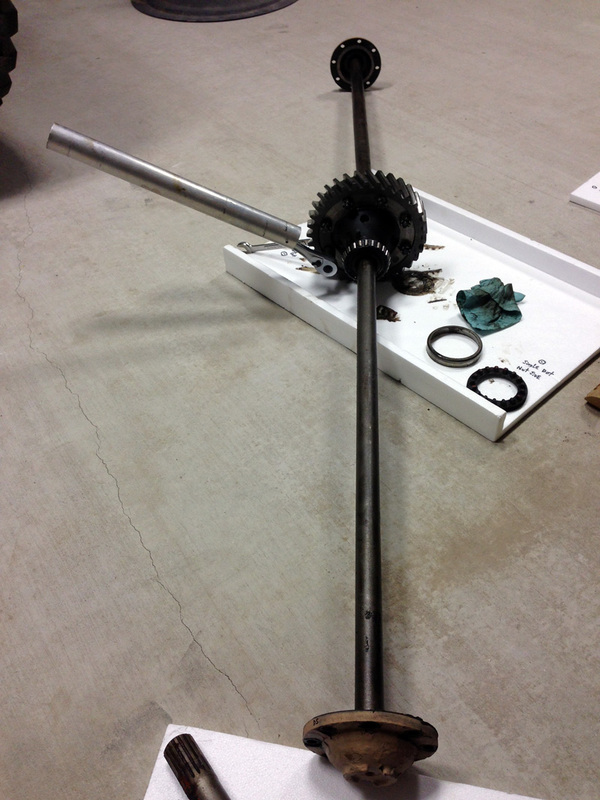 What I thought was just a snapped rear axle shaft turned out to be worse. 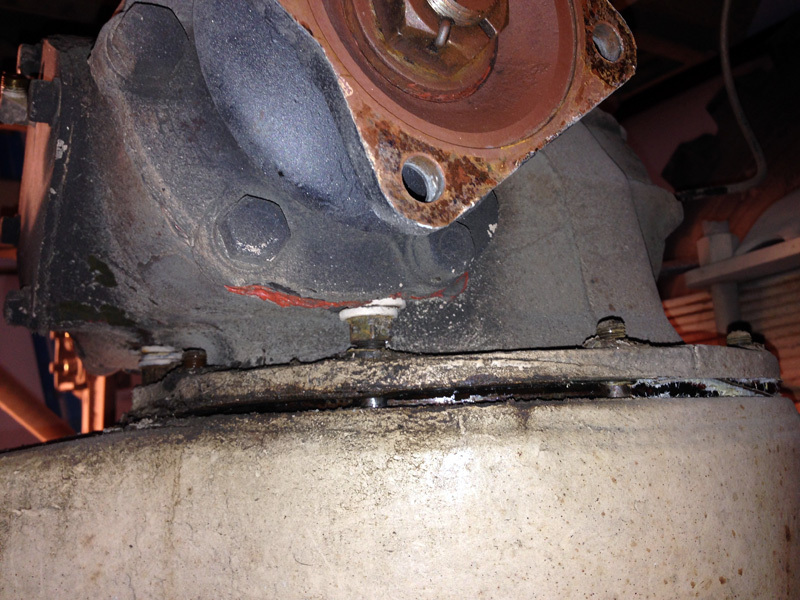 I started by draining the rear axle housing fluid. 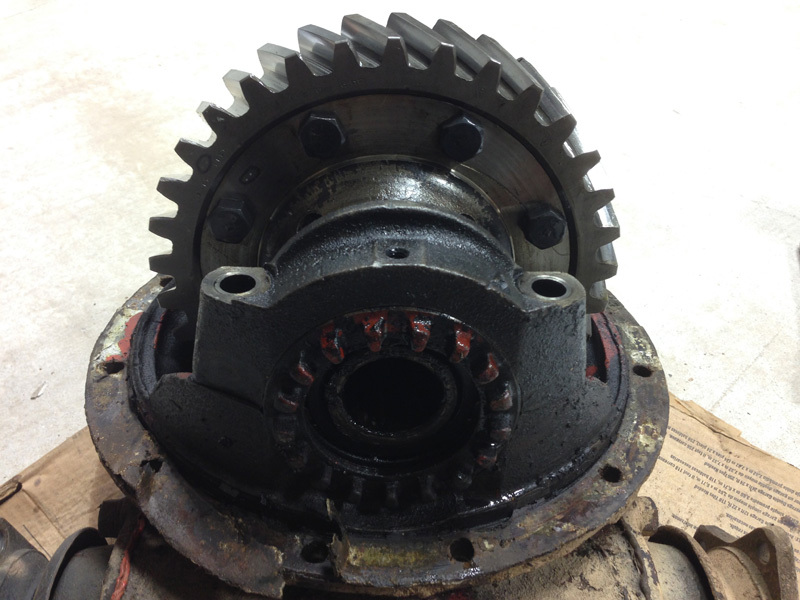 When chunks came out I had my answer - the rear differential had started to break apart during my last rescue operation (huge stuck U-haul). 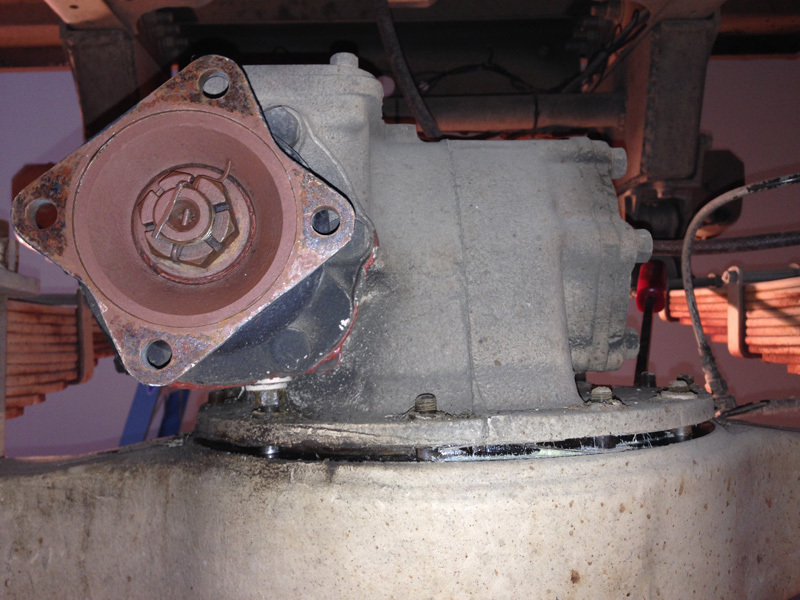 To prove that point I proceeded to remove the passenger side axle shaft without issue. 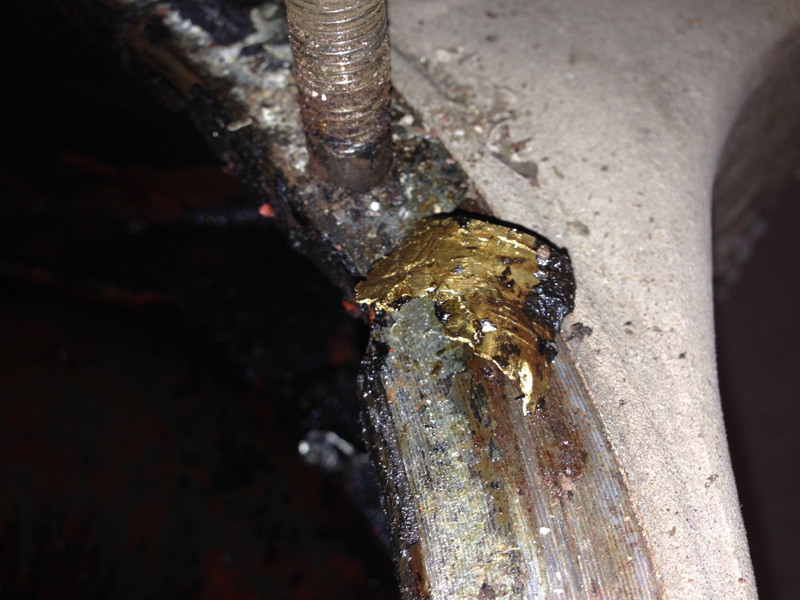 When I tried pulling the driver side axle shaft out it wouldn't budge. 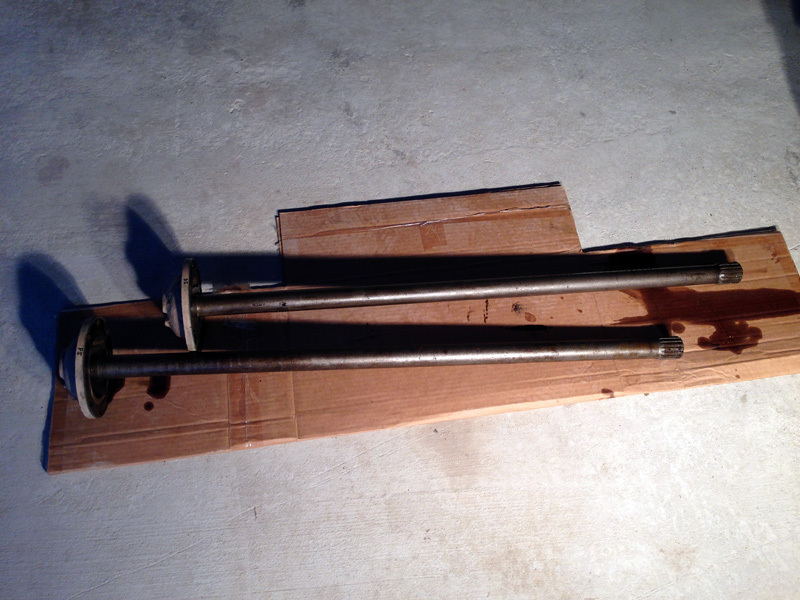 I ended up using my trusty flagpole to beat the driver side rear axle shaft out from the passenger side. 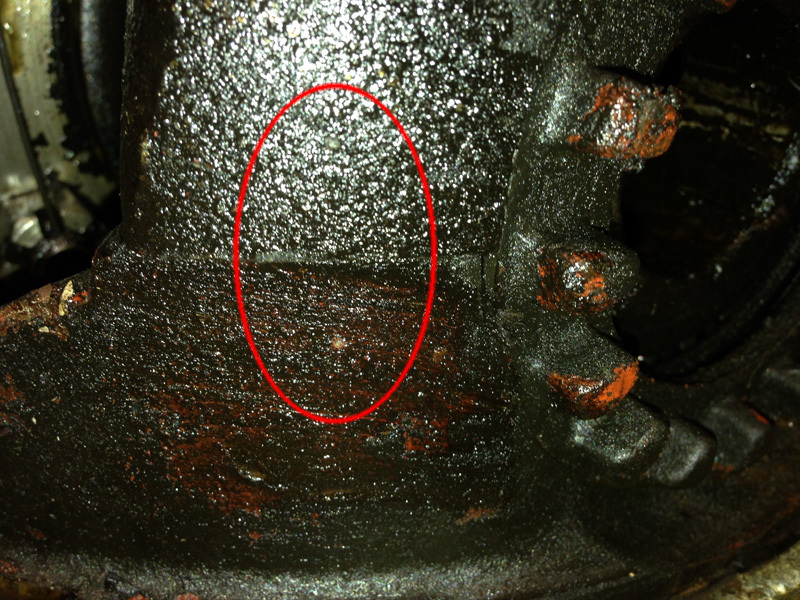 Neither rear axle shaft had any twisted splines or cracks. 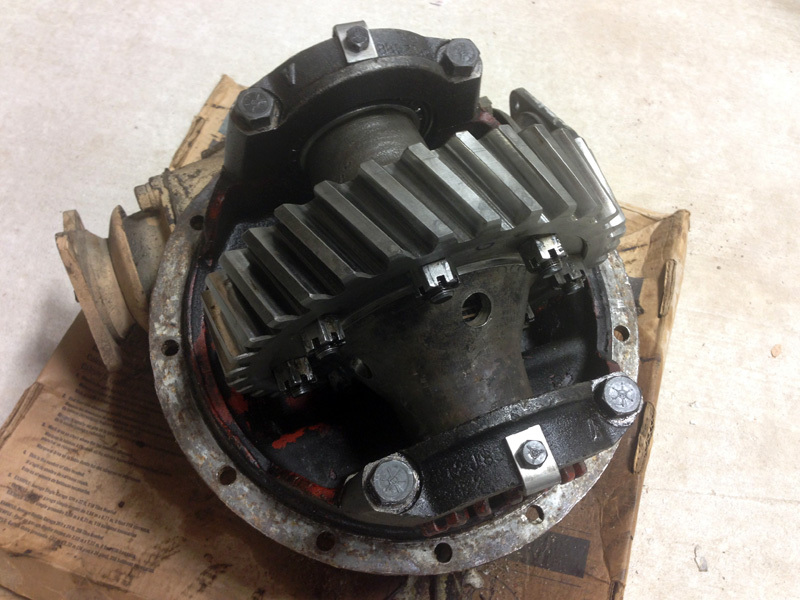 With the engine off I put the transmission in neutral and turned the rear-most pinion on the back axle. 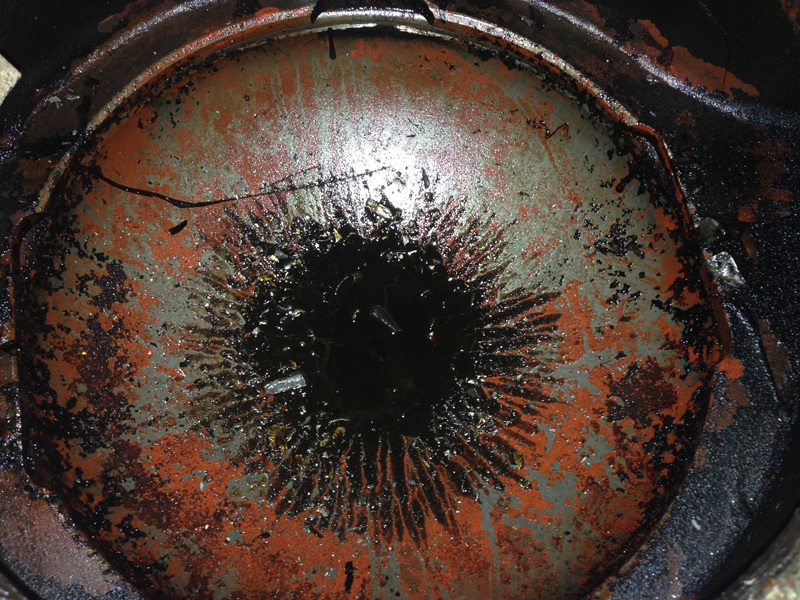 What I heard sounded like broken glass being tossed around inside of a dryer. 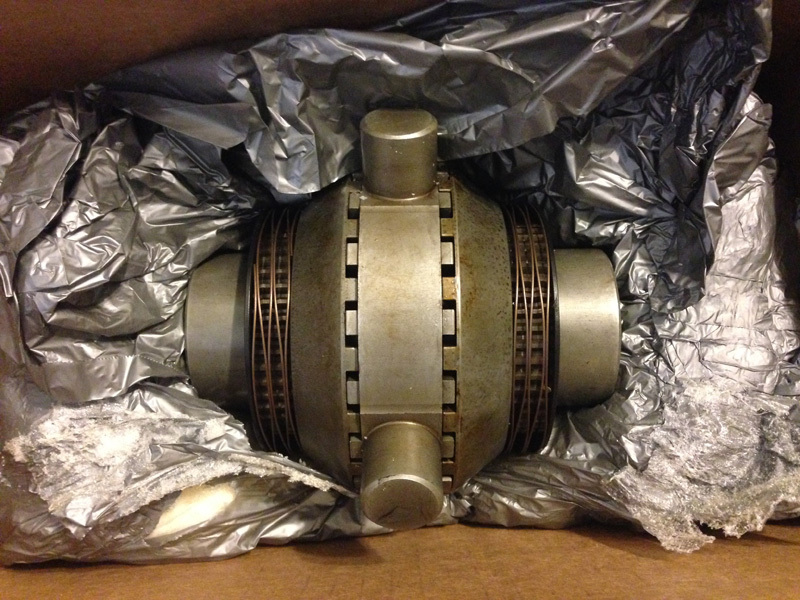 I called Steve at Ouverson Engineering & Machine, and I ordered a Rockwell 16 Spline Locker to replace my shattered rear differential. 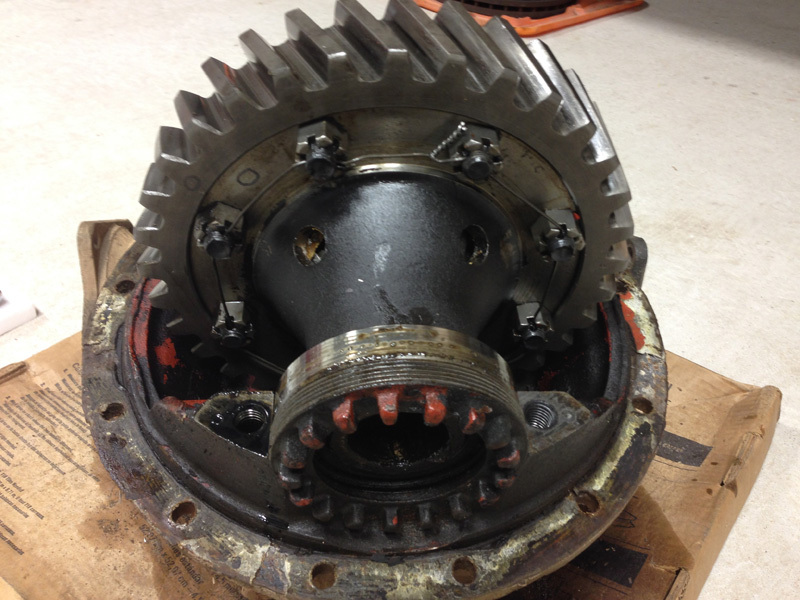 No matter what was damaged the Ouverson locker would replace all of the differential internals. 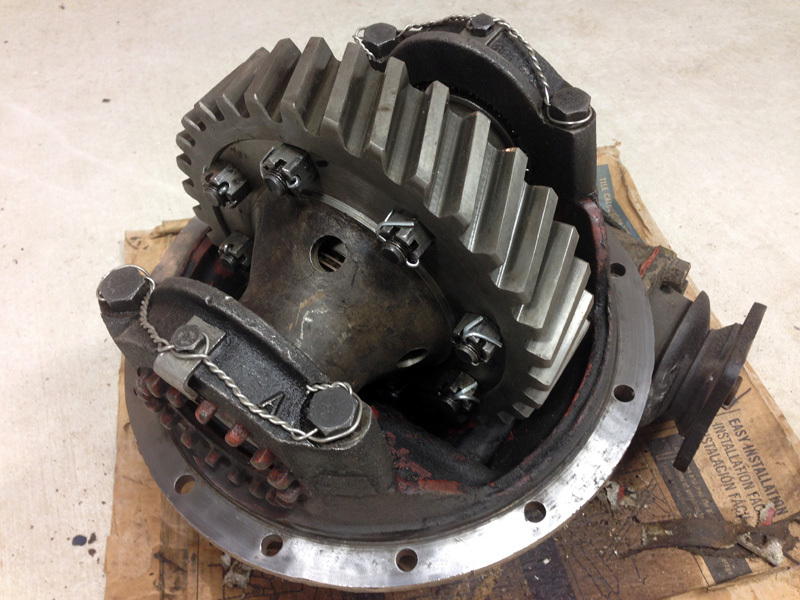 I continued the tear down by getting a buddy to help remove the rear differential housing. We ended up using a 1.5" pipe between the bottom of the M105A2 bed and the top of the oak boards sitting atop the deuce frame. 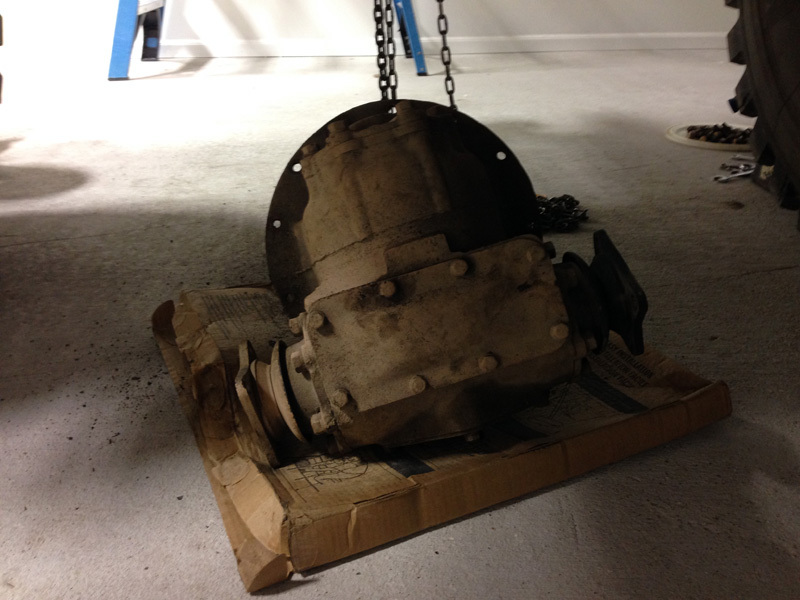 A 1-ton chainfall and a choker did the rest of the lifting duty. 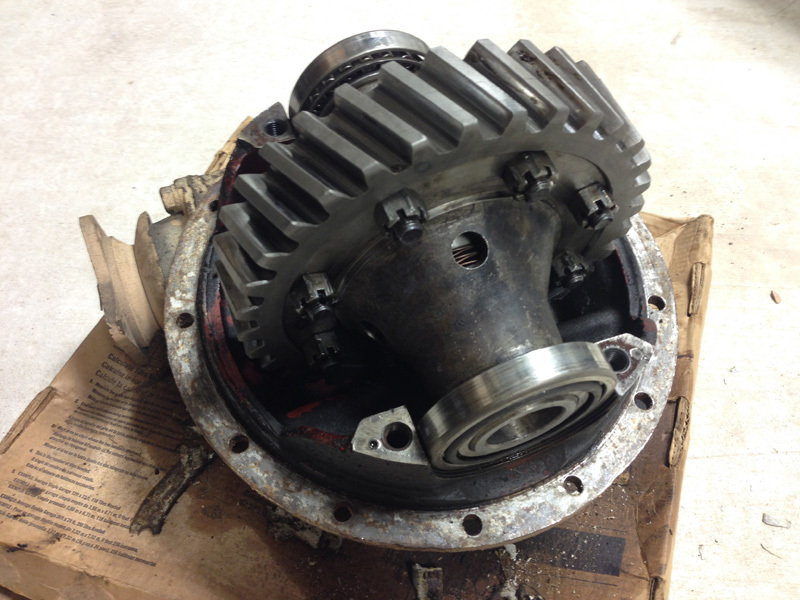 Once the rear differential housing was on my shop floor I flipped it over and marked the bearing caps, carrier halves, ring gear sides, and pinion flanges before disassembly. 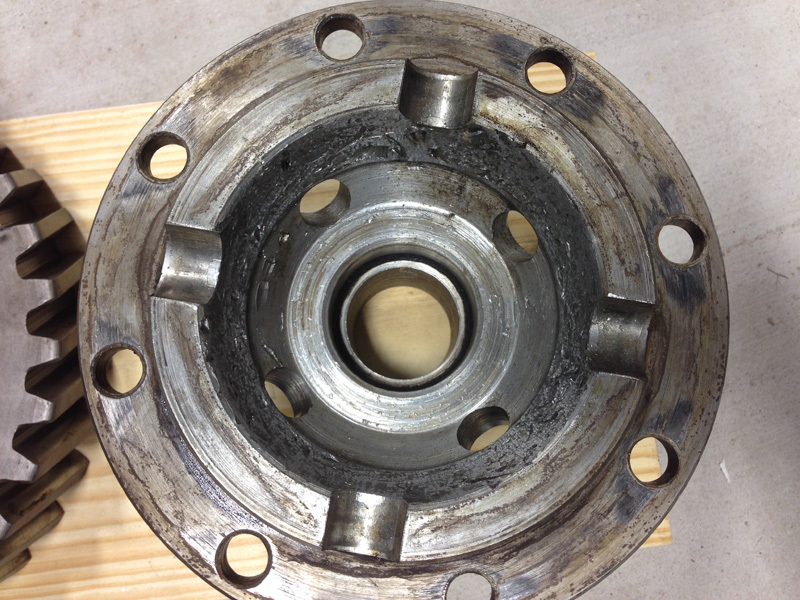 Everything has to go back into its place because all of the parts have worn together. Follow along on the pictures as I remove the broken parts and replace them with the Ouverson locker. 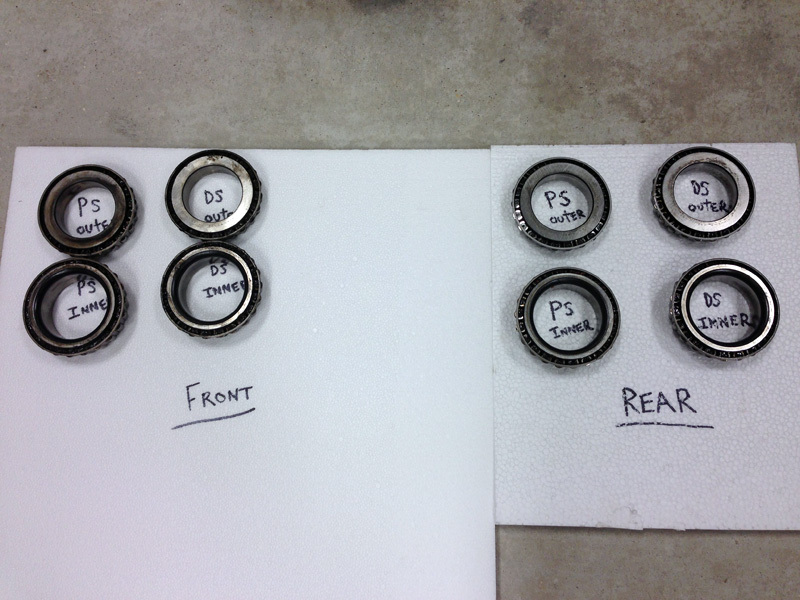 Lastly, the bearing caps get safety wired to prevent vibrations from making the bolts back out. 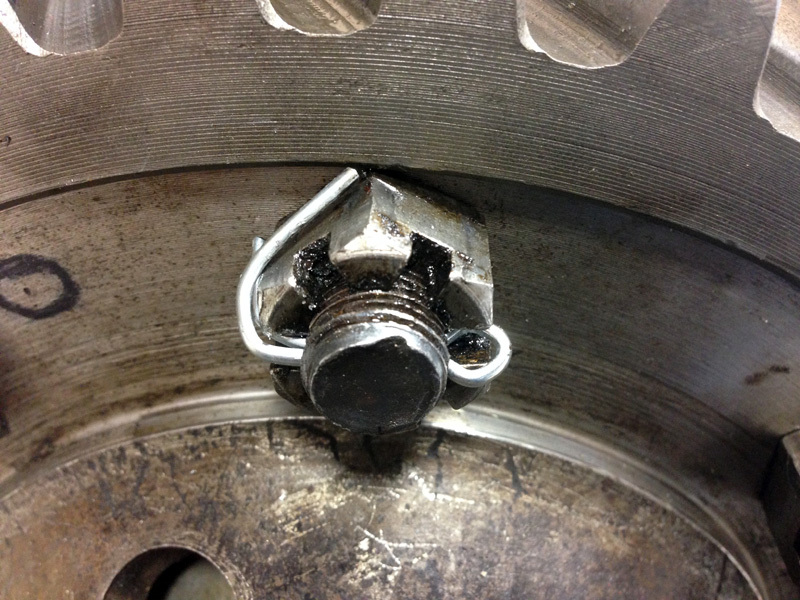 The ring gear castle nuts are cotter pinned instead of safety wire. No issues there. - A bunch of Shop Towels! 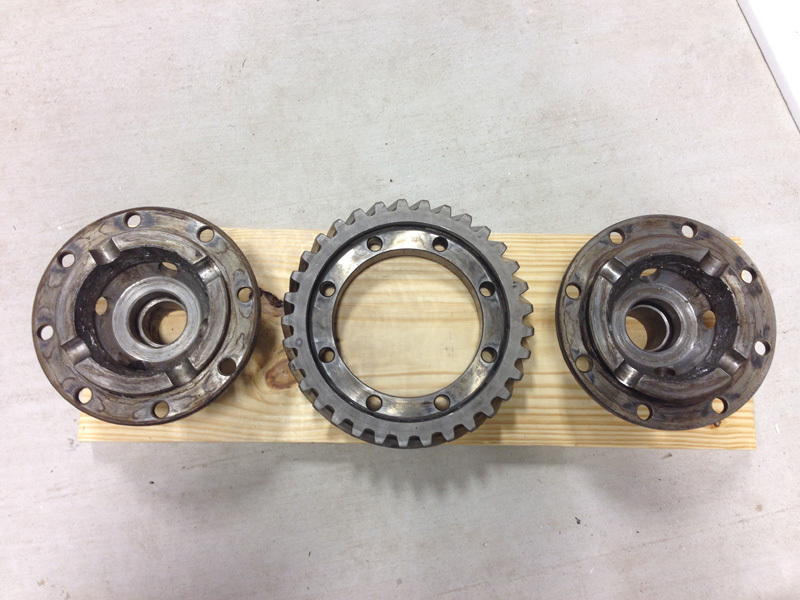 - 3rd member = Center Chunk = Differential Housing = Ginormous thing with the driveshaft going to it. 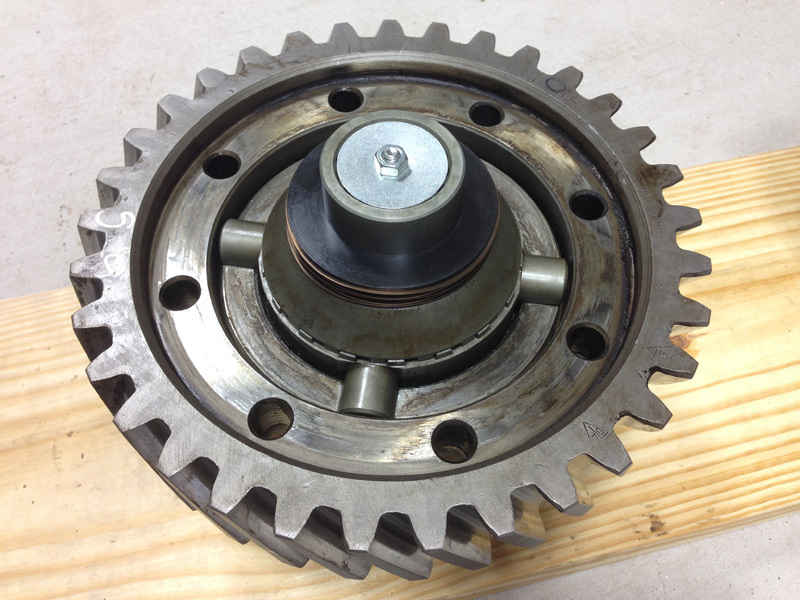 - Bull Gear = Ring Gear = That big round gear with the differential carrier halves bolted to it. 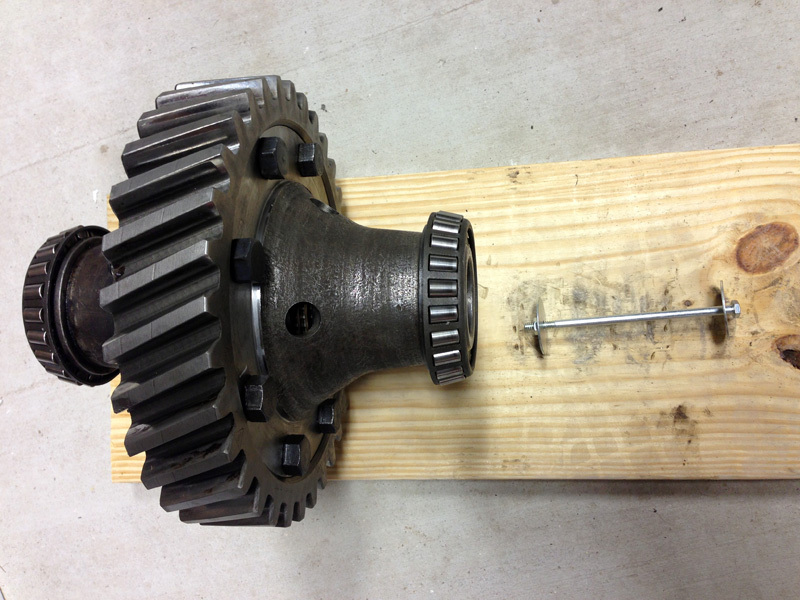 - Bottom gear = Bevel Gear = What connects to the Bull Gear. 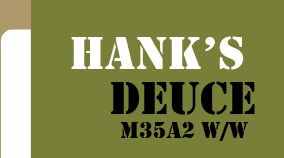 1) These steps basically work for installing an Ouverson Locker in the front/middle/rear axles on a M35A2. 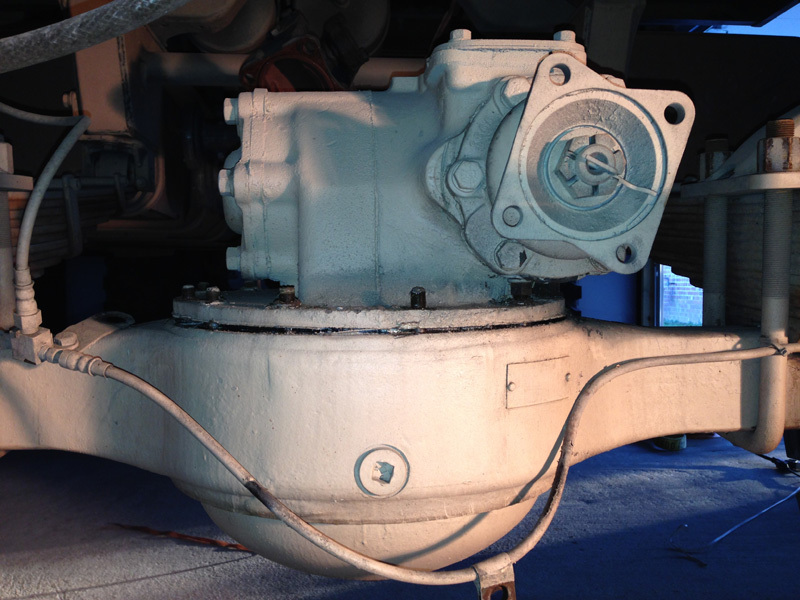 The removal steps below will work better for the middle/rear axles. 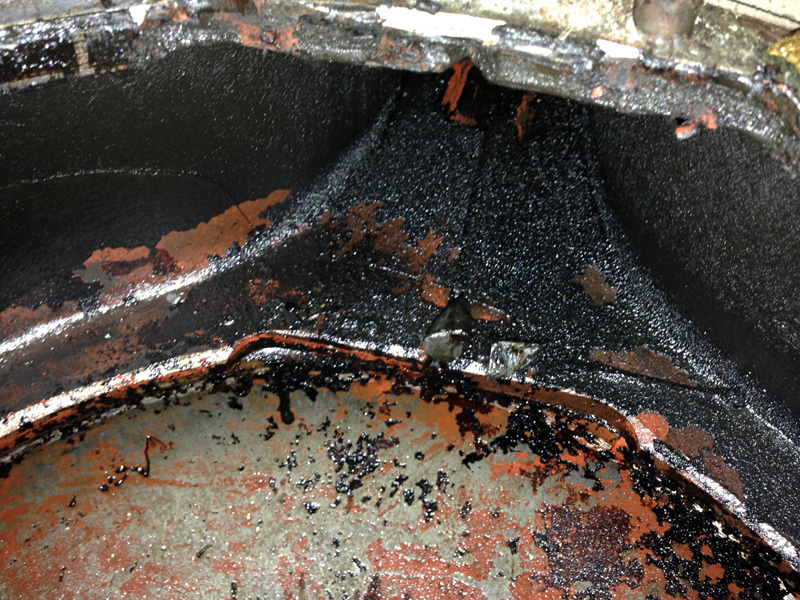 It is a little more difficult to remove the front differential due to clearance below the engine's oil pan. 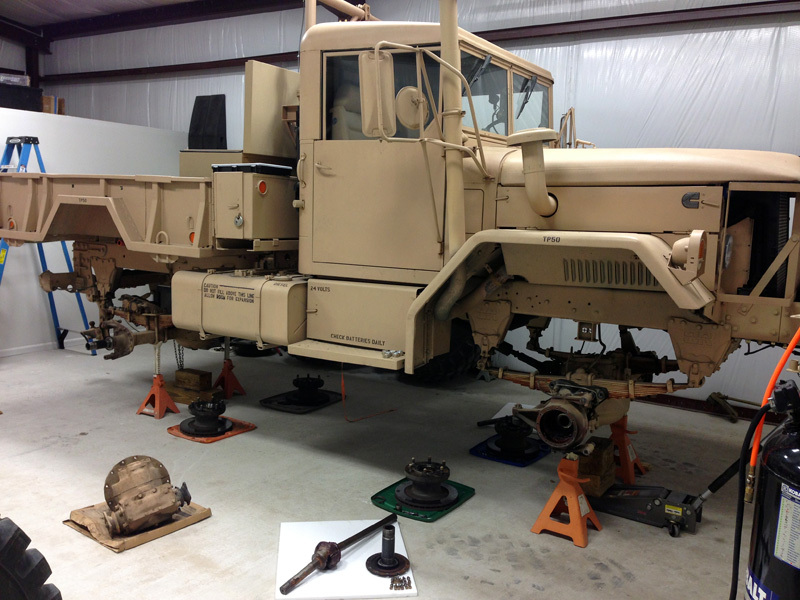 Some folks have been known to remove the entire front axle assembly for easier access to work on the center chunk. 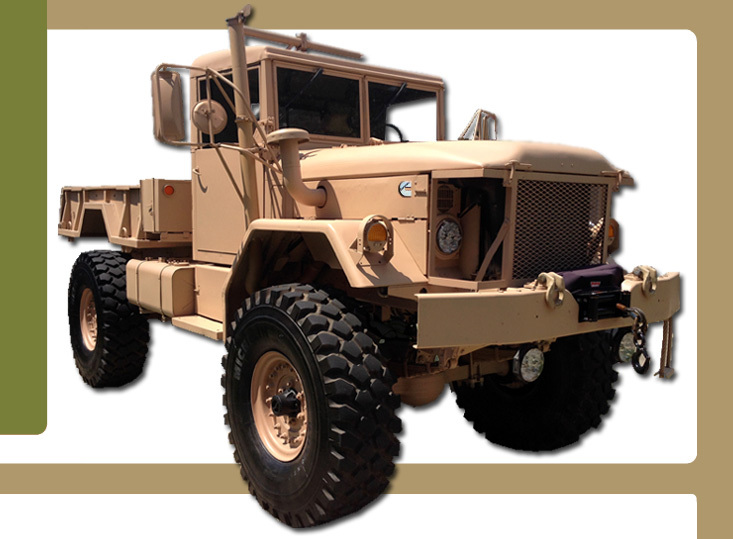 2) It is not necessary to jack up your deuce, but in the pictures my bobber is on jack stands because I'm changing the bearings and seals due to flood water damage from recent rescue operations in the great 2016 Louisiana Flood. 3) Follow the TM starting with Section 10-4. 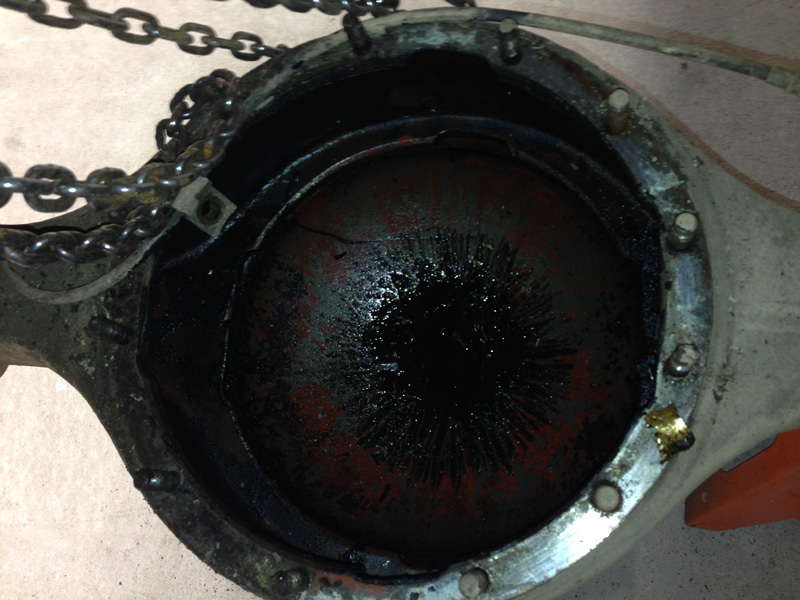 Drain the gear oil. 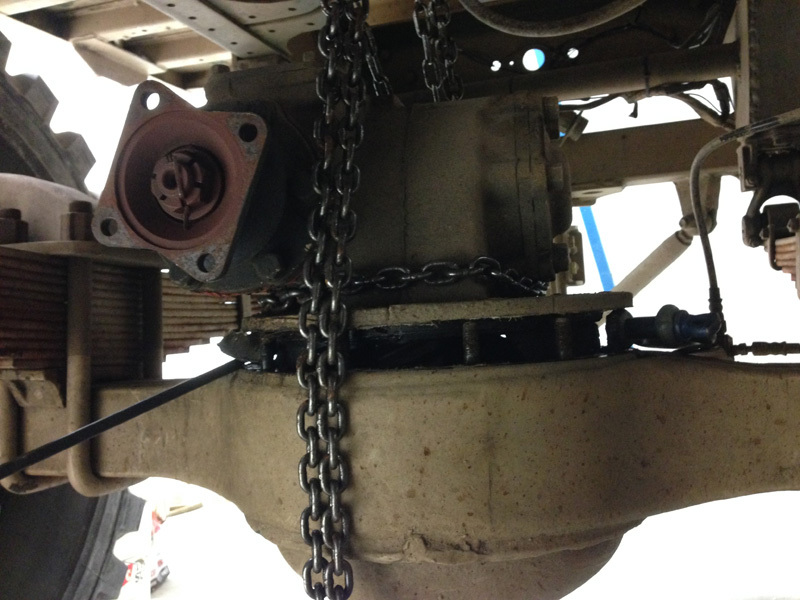 Remove the driveshaft connecting to the differential assembly. 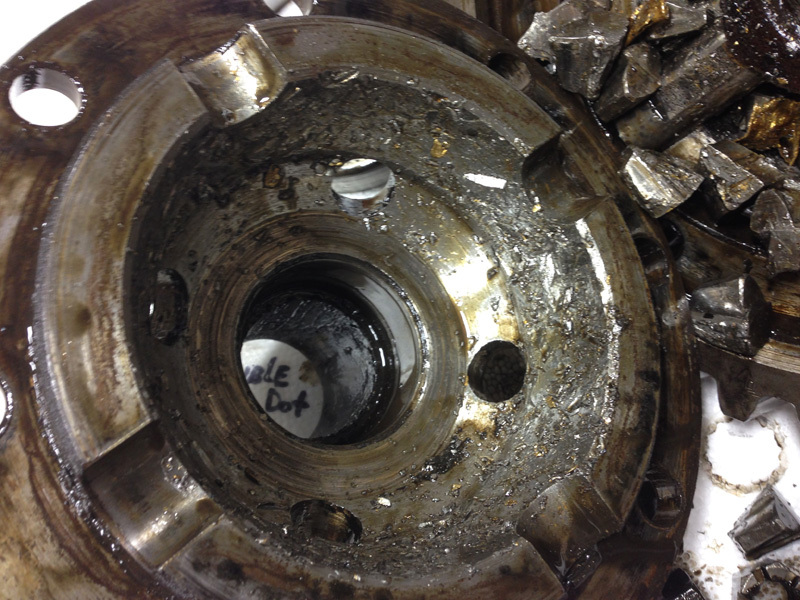 Remove the axle shafts from the axle housing. 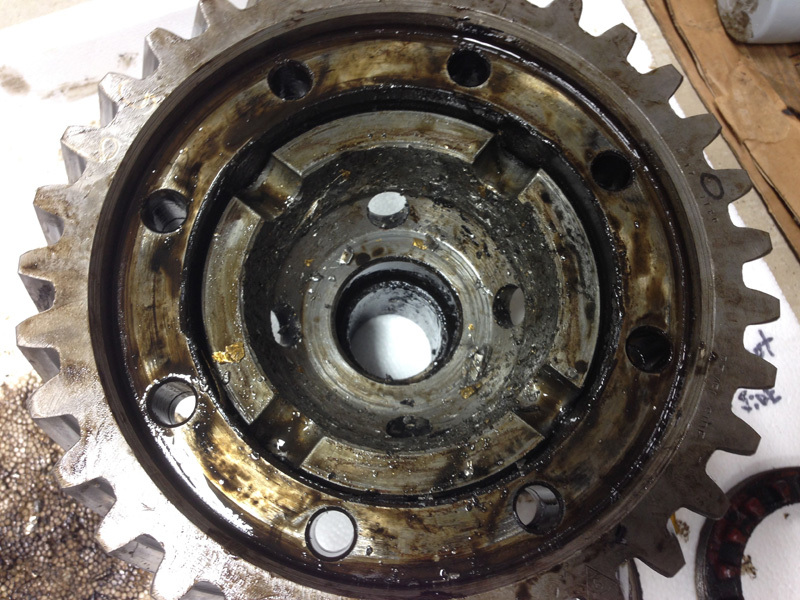 4) Remove the nuts/washers from the open area of the differential. 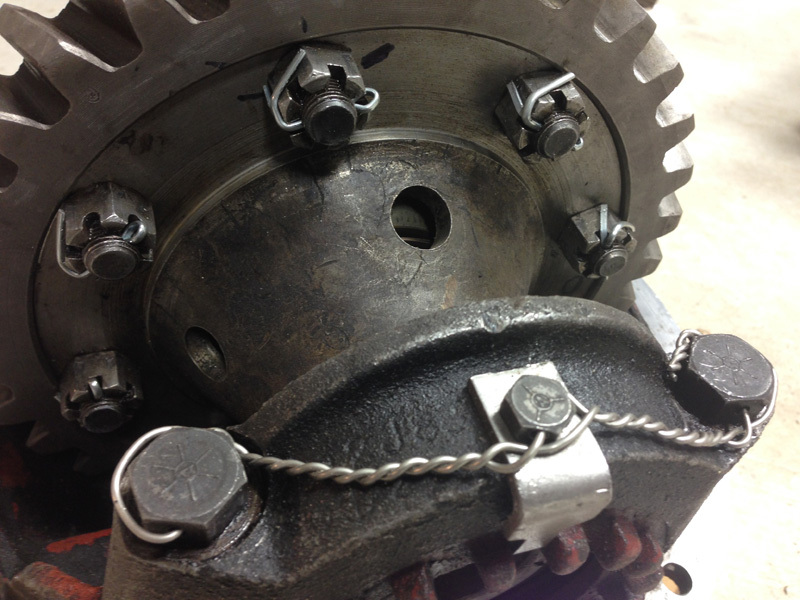 Follow along with the pictures and place a few split lock washers on top of the nuts that are under the pinion gear housing (on both sides). 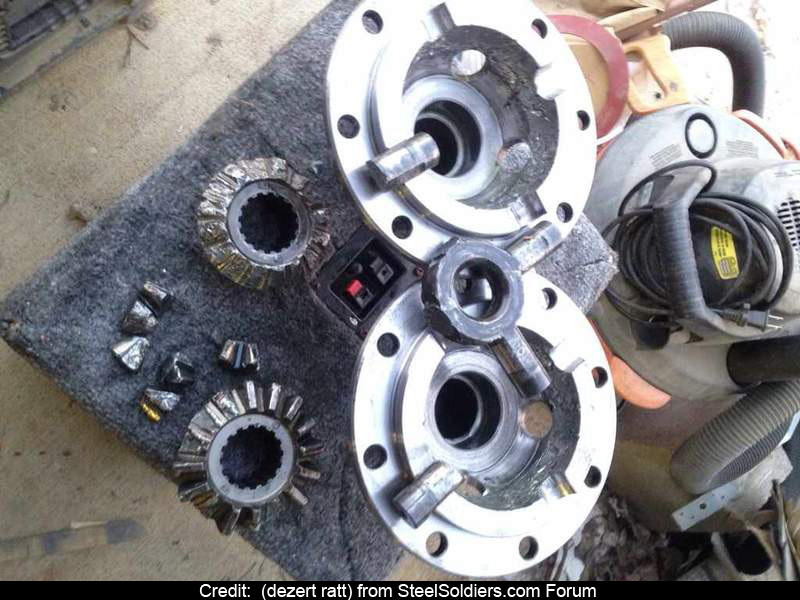 As you loosen the nuts and they travel upward on the studs they will help pick up the differential housing from the axle housing. 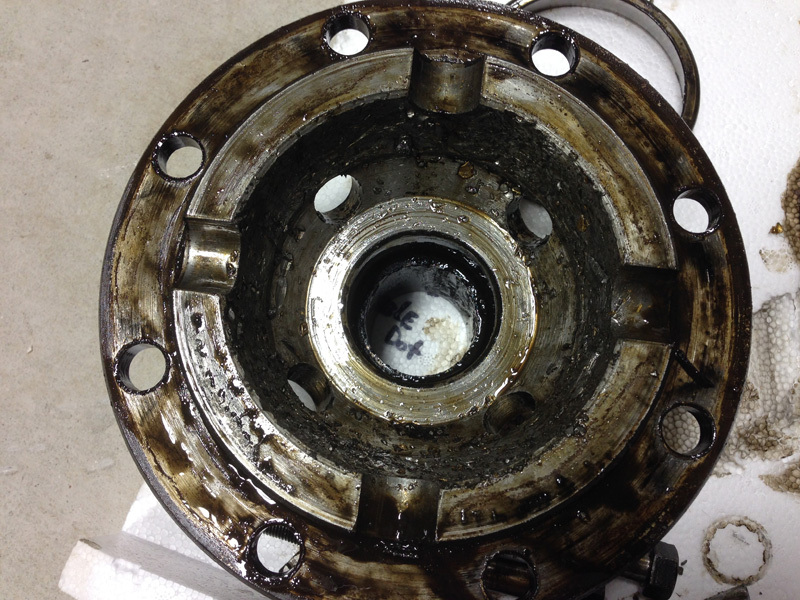 This technique will help break loose any type of gasket or sealant used between the diff/axle housings. 5) Slide your pipe between the bed and the top of the oak that runs under the bed. 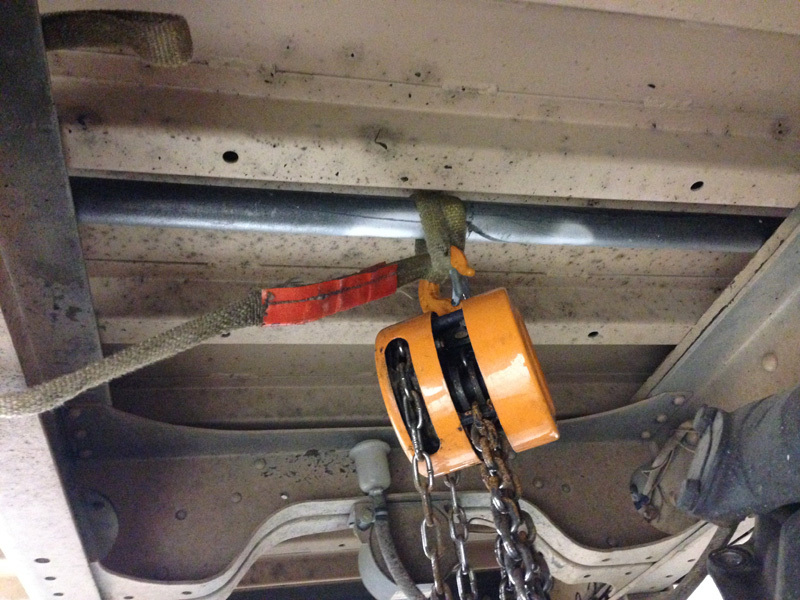 Wrap a small choker around the pipe and connect it to the lifting hook of the chainfall. 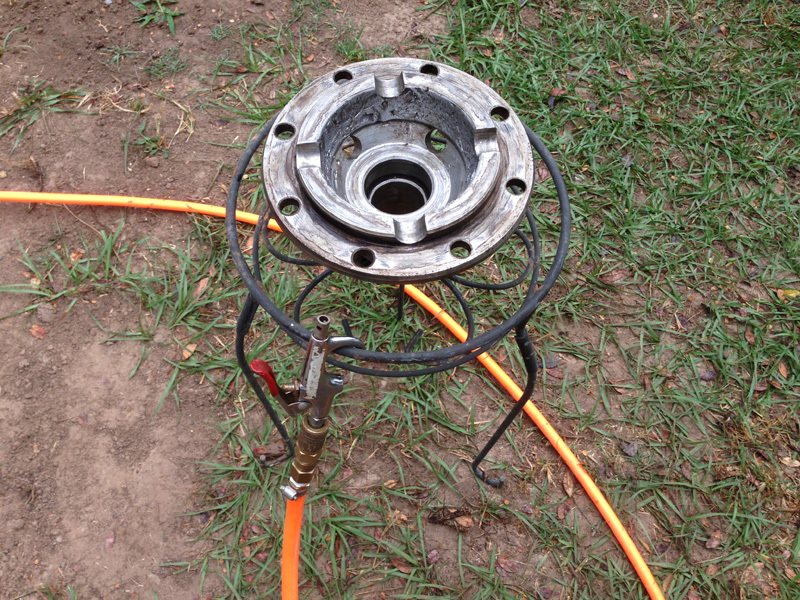 If your chainfall has a big enough hook you can connect it directly to the pipe. 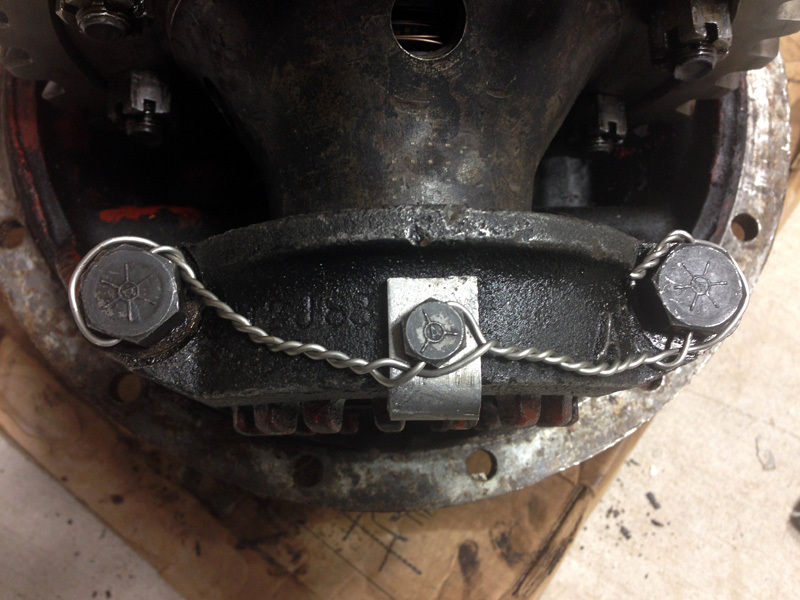 Wrap a second choker or chain around the differential housing and connect it to the bottom of the chainfall. 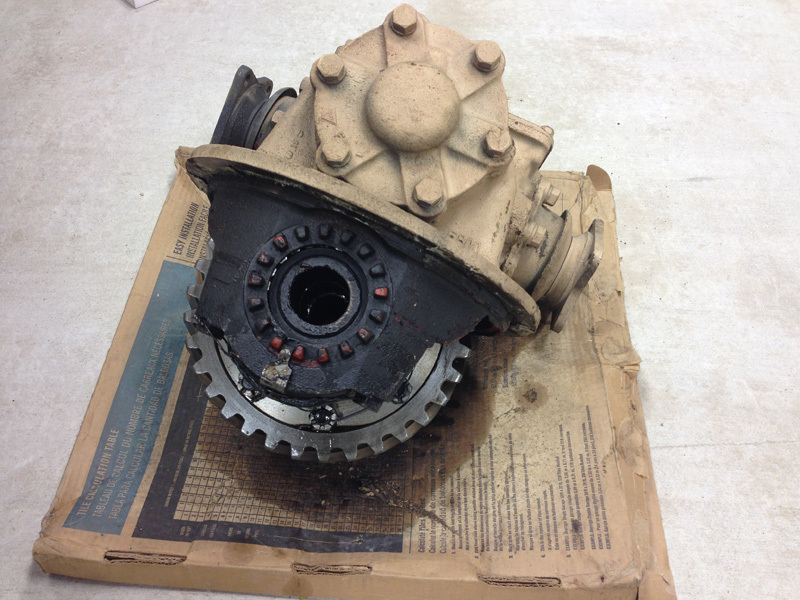 Remove the differential housing from the axle housing. BE CAREFUL! THIS THING IS HEAVY! 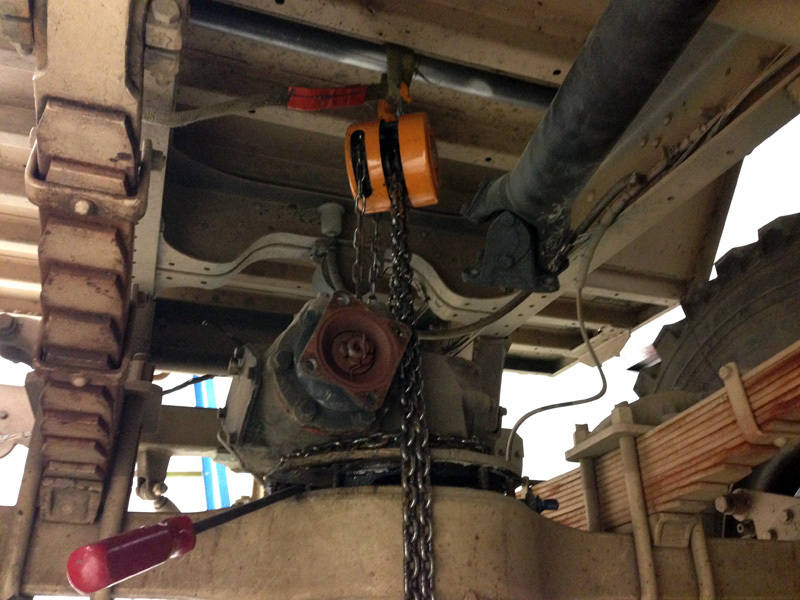 Lower the differential housing to the ground/concrete below. Slide it out to an open area for working on it. 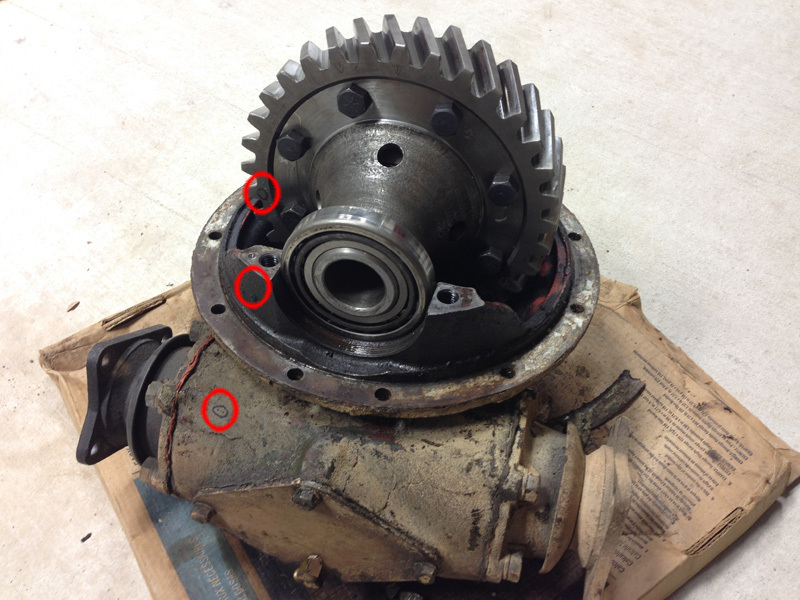 6) Turn the differential housing upside down so that the bull gear is facing up. This makes it easier to work on. 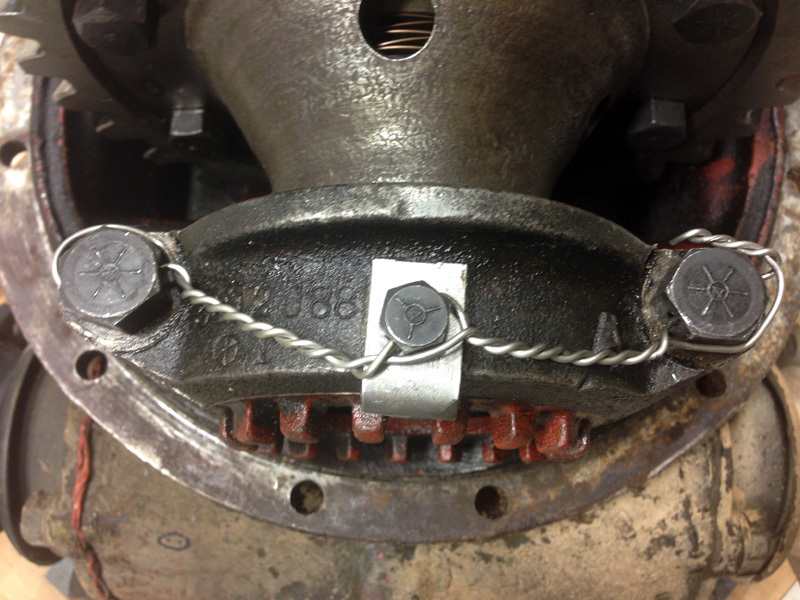 7) Take your favorite hammer and a center punch or some sort of scribe to mark each side of the differential. I chose to mark a single dot on the left side and (2) dots on the right side. 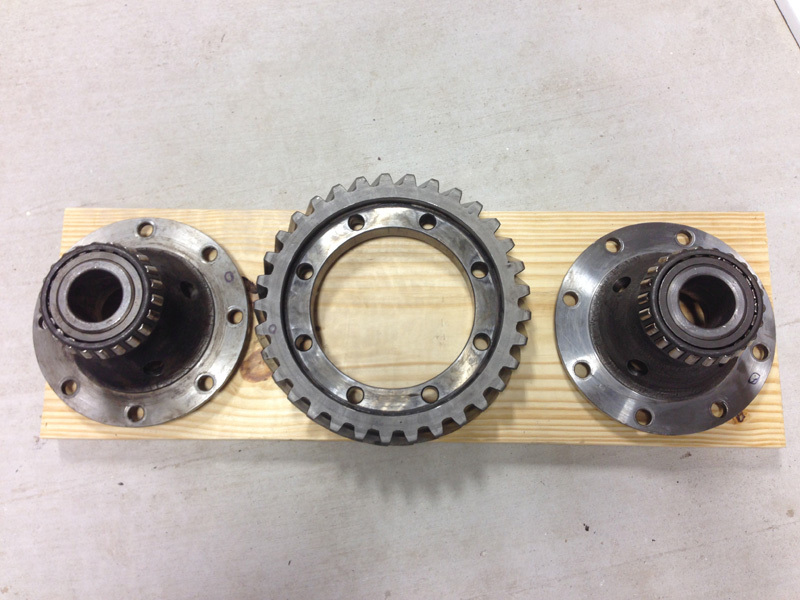 Make sure to mark each of the bearing caps, each carrier half case that bolts to the bull gear, each side of the bull gear, and each side of the differential housing. 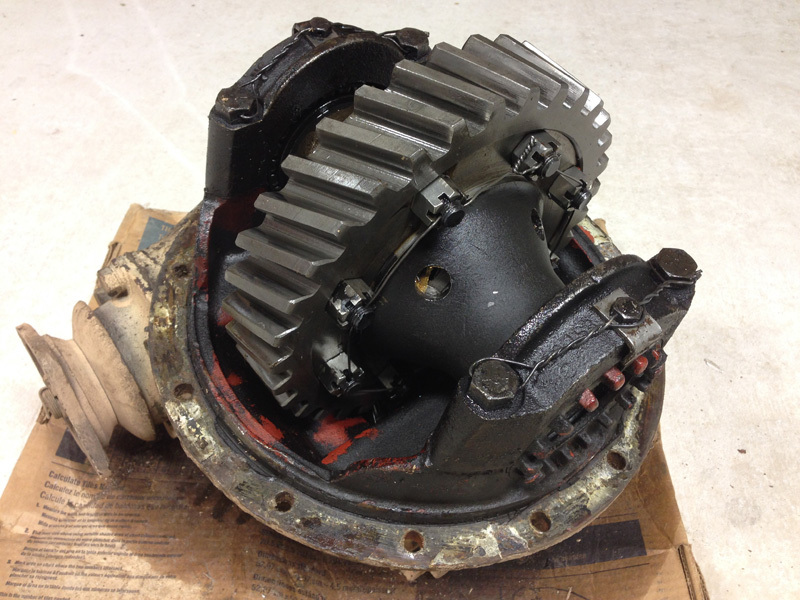 I didn't remove or replace the bearings on the rear differential, so they stayed on the carrier halves. 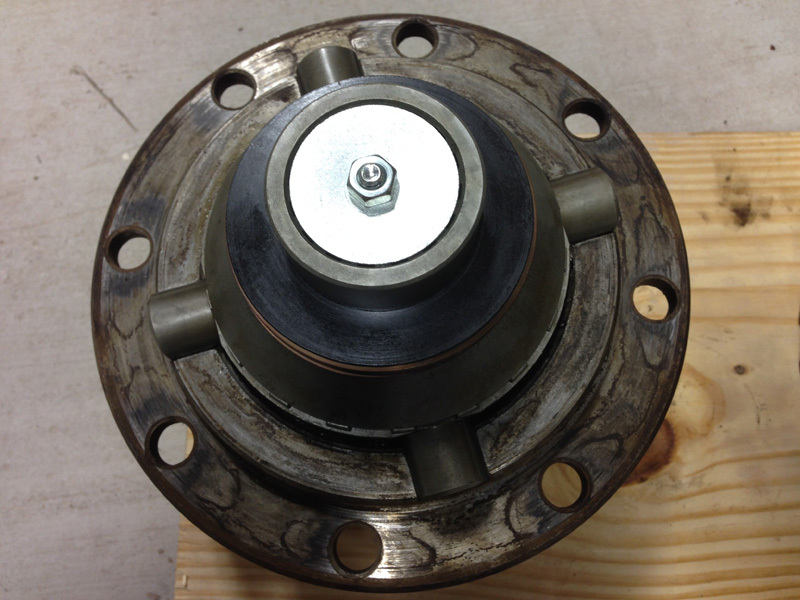 Make sure to mark and keep up with the bearing seats for each half of the differential. 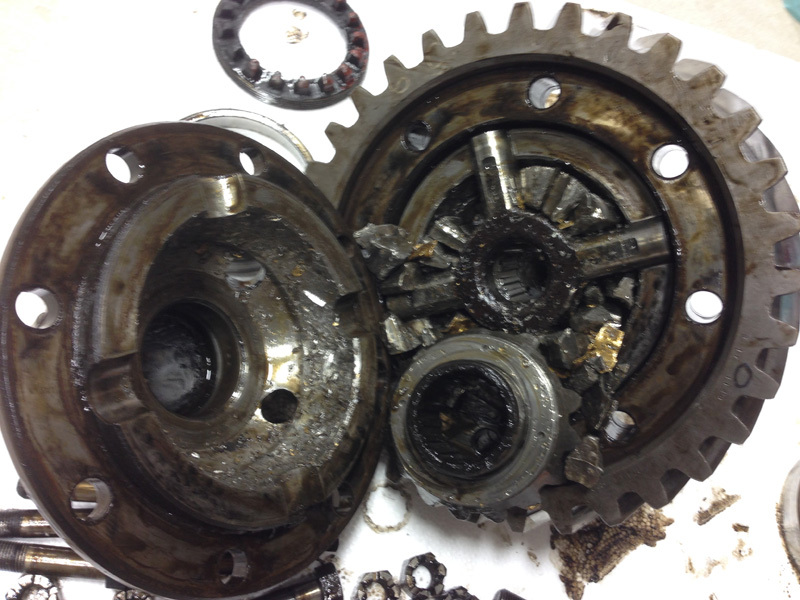 8) Take a few pictures before disassembly to make sure everything goes back where it should. If you don't have a camera use your trusty smartphone that you surf Steel Soldiers with all day at work. 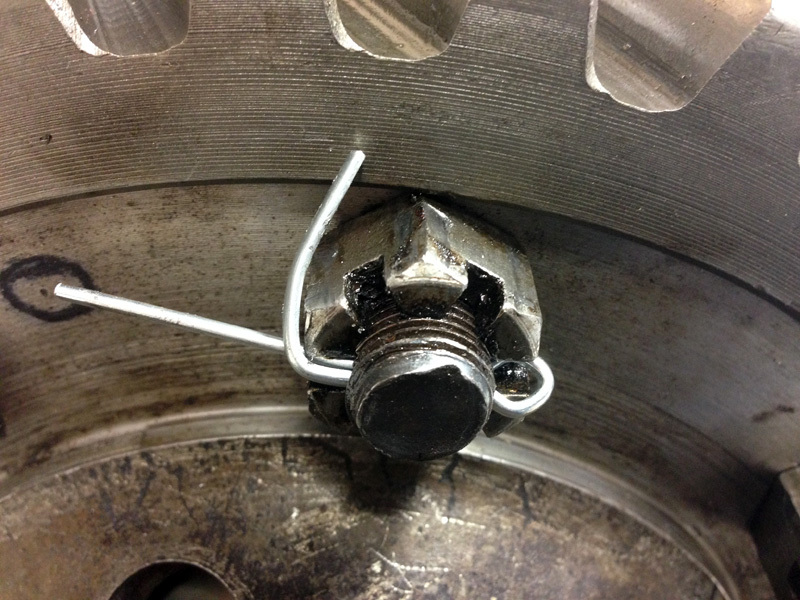 9) Cut the safety wire on both bearing caps, and loosen the (4) bearing cap bolts. 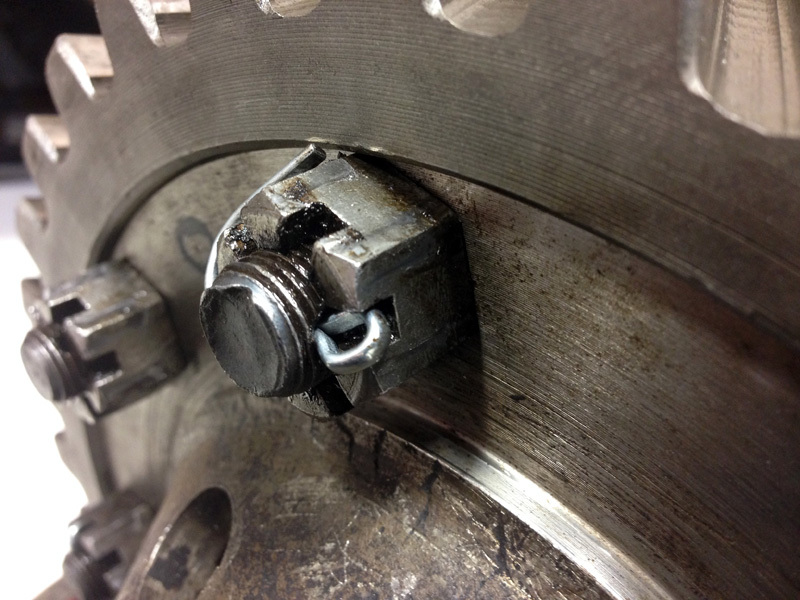 Remove the (2) set screws and adjusting nut lock tabs from the top of the bearing caps. Set aside. 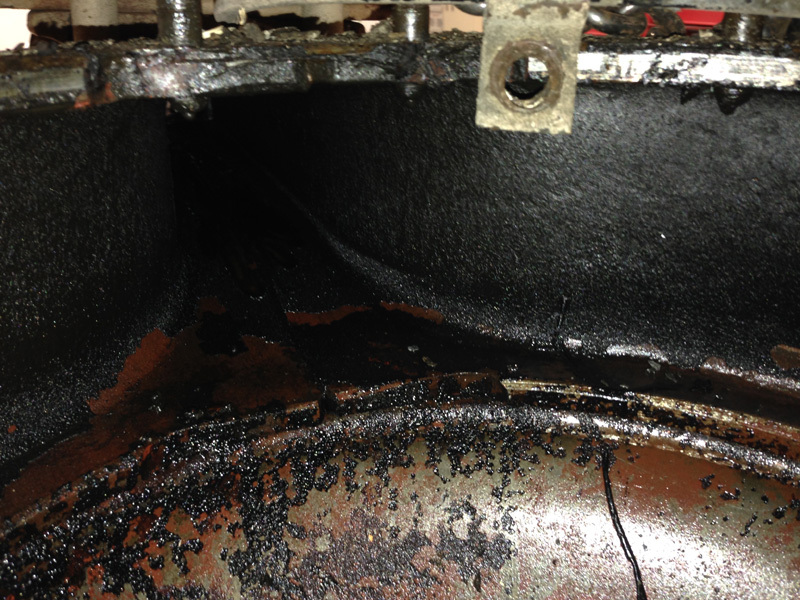 Removing the bearing cap bolts and set aside. 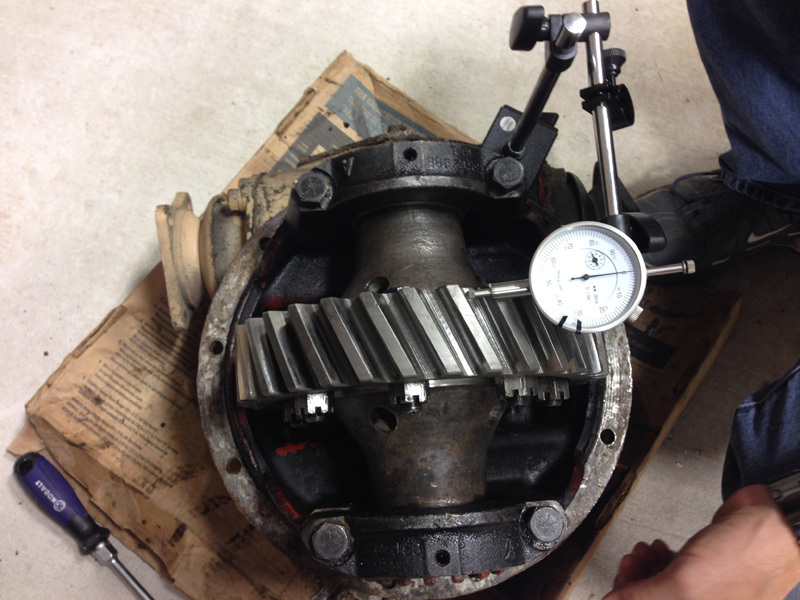 10) Remove the entire differential assembly from the housing and place it into a vise. 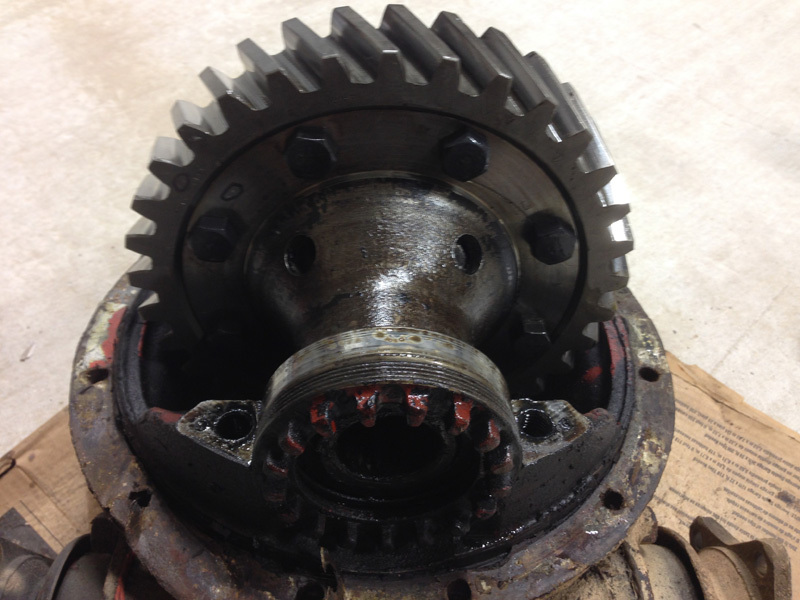 Make sure not to damage the bull gear teeth in the vise. 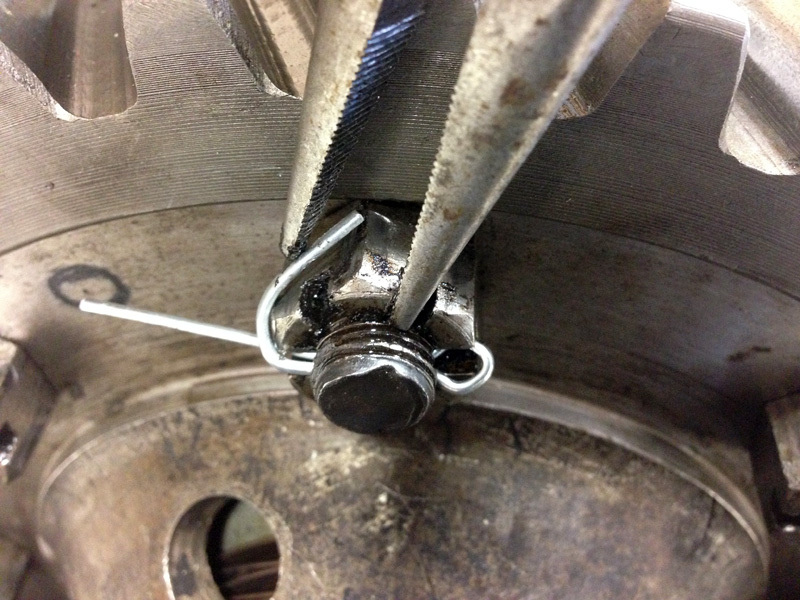 Use soft inserts in your vise if you have them, and tighten it against the side of the bull gear. 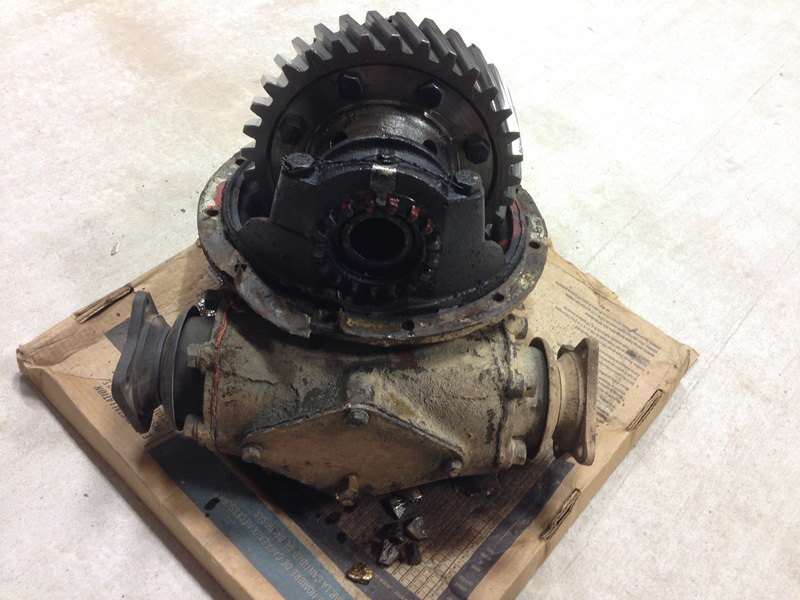 I didn't have that option so I kept the differential assembly on the floor for disassembly. 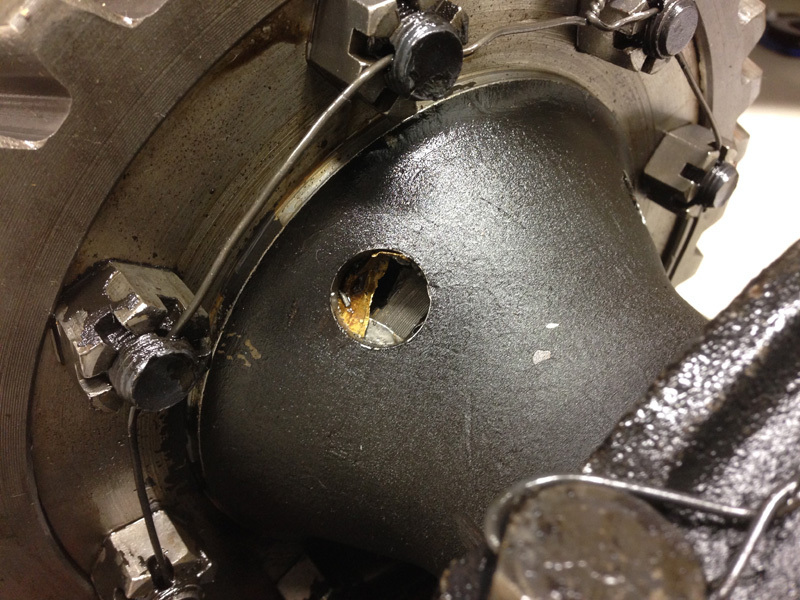 Reason #256 to buy a Vise! 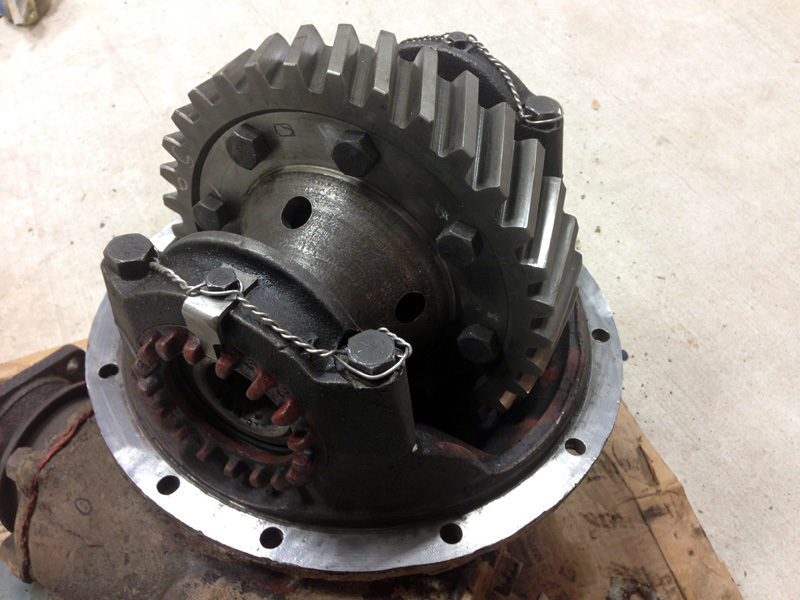 11) Cut the safety wire on the bull gear. 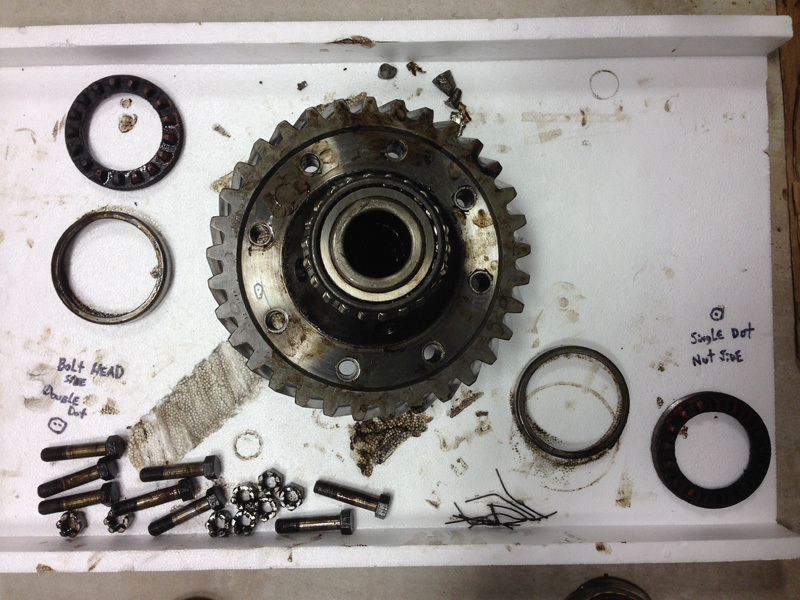 Remove the (8) nuts and bolts from the bull gear. Set aside. 12) Remove either carrier case half. 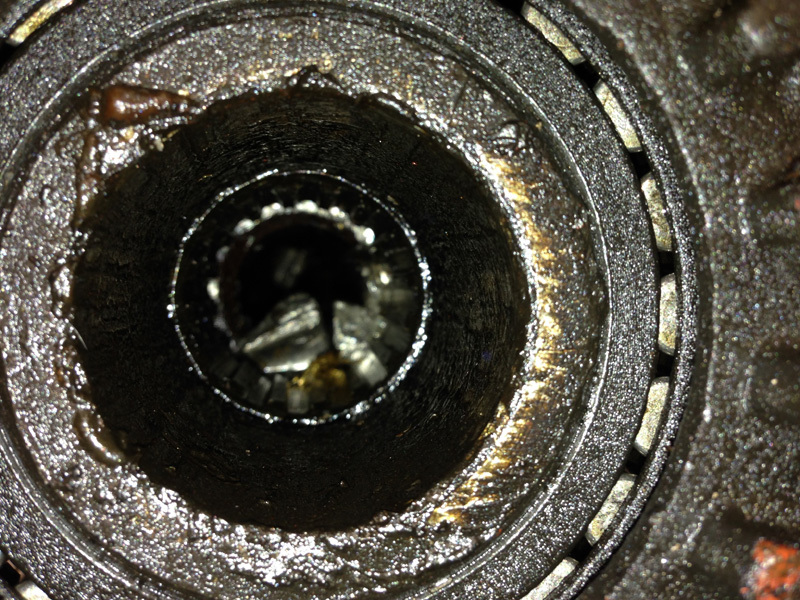 Make sure to catch the internals that will try and fall out (side gears, spider gears, thrust washers). 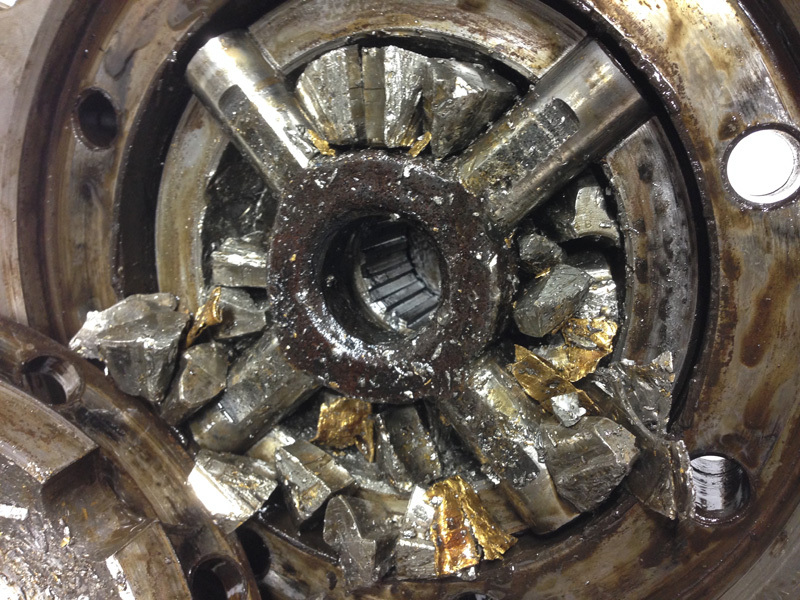 Note my internals in the rear differential were trash because I shattered everything during a heavy pull during the flood rescue. 53 inch tires and the stock spider gears don't work too well together with a little bounce during tugging a stuck U-haul. 13) Repeat Step 12 for the other carrier case half. 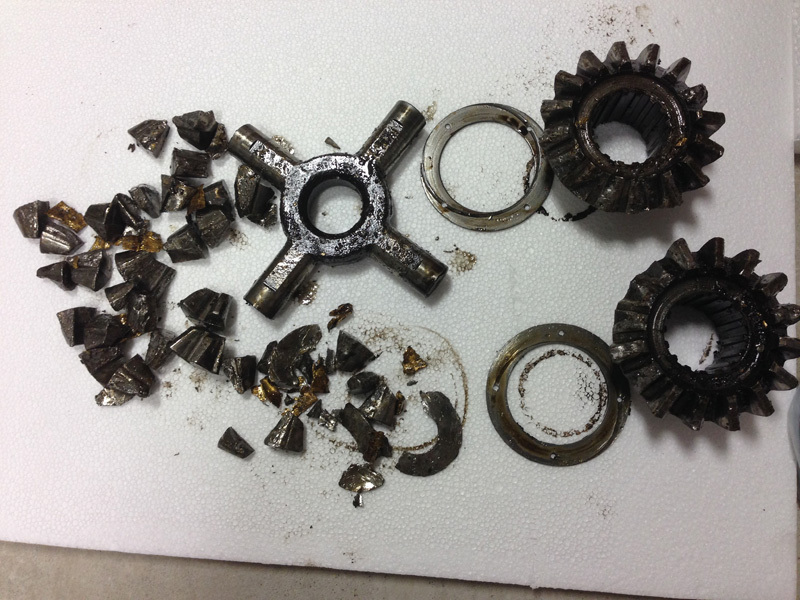 Discard all of the differential internals or keep them you hoarder! 14) Clean up each carrier case half. 15) Unbox the Ouverson Locker. Be amazed at what you are holding in your hands. Give yourself time to recover from the excitement. We don't need trembling hands here. 16) Place the locker into either carrier case half. I'm left handed so I chose the left side carrier case half. Don't judge me! 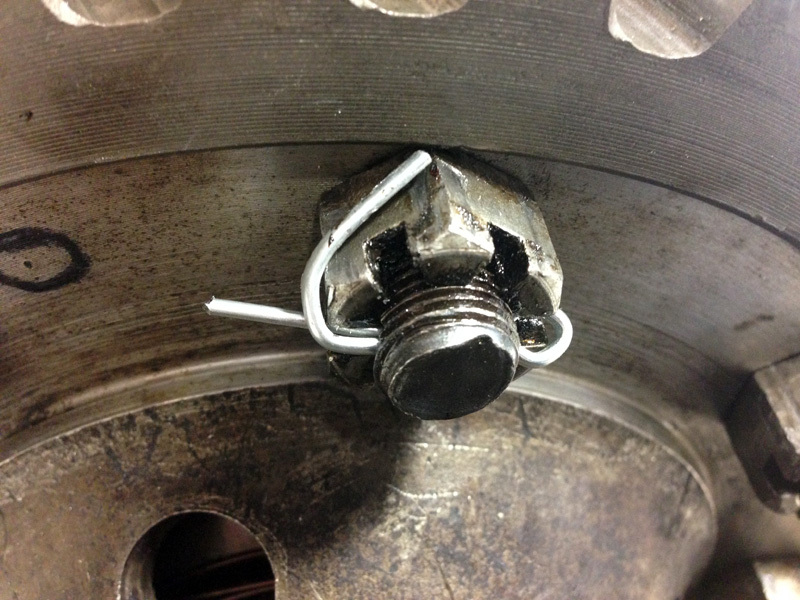 DO NOT remove the long bolt/nut/fender washers from the Ouverson Locker yet! 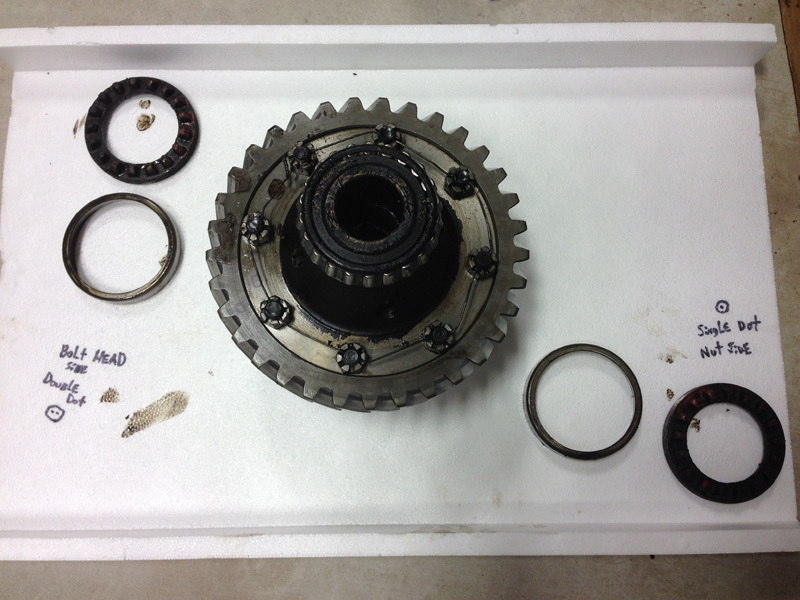 17) Mate up the other carrier case half to the bull gear. If you are Canadian you might say "Offer up the other carrier case half, eh?" (insert a few cuss words for good measure for our northern neighbors). 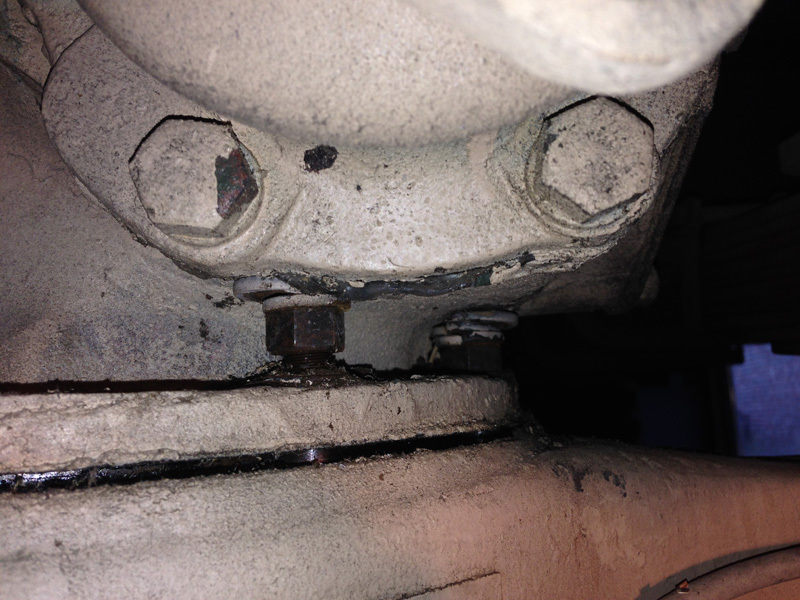 Align the bolt holes and reinstall all (8) bolts. 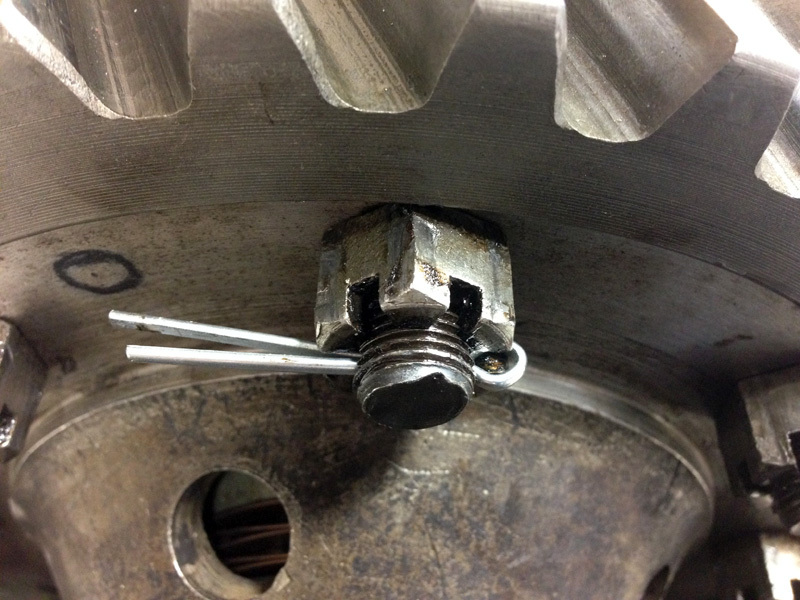 18) Follow a good 3-step torquing regiment to tighten the (8) bull gear case half bolts. 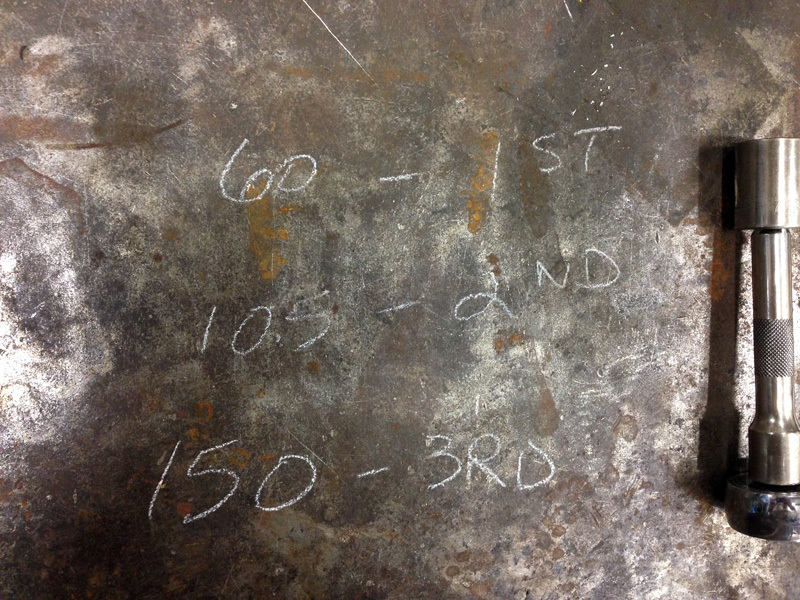 I used 60 ft-lb, 105 ft-lb, and finished with 150 ft-lb. Your mileage may vary. Ain't no metric system within 100 yards of my house. You can keep your newton meters. 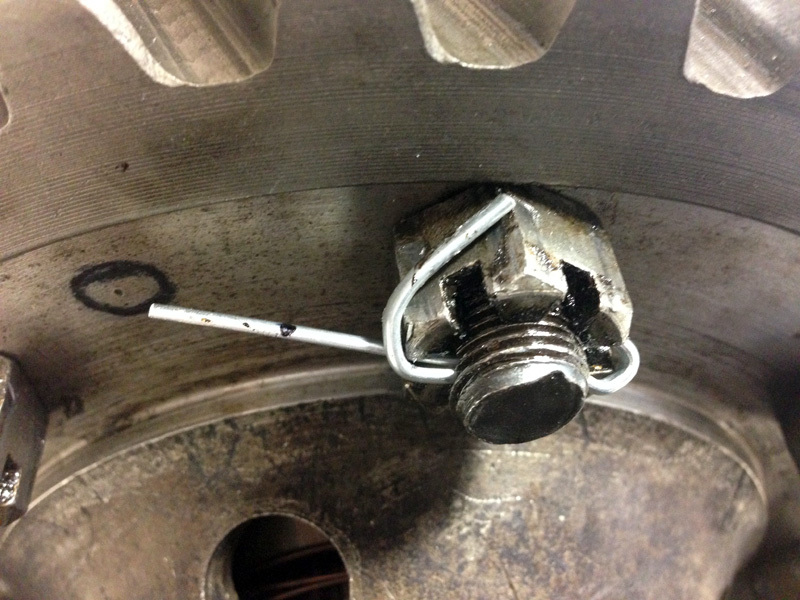 19) Remove the bolt/nut/fender washers from inside the Ouverson Locker. 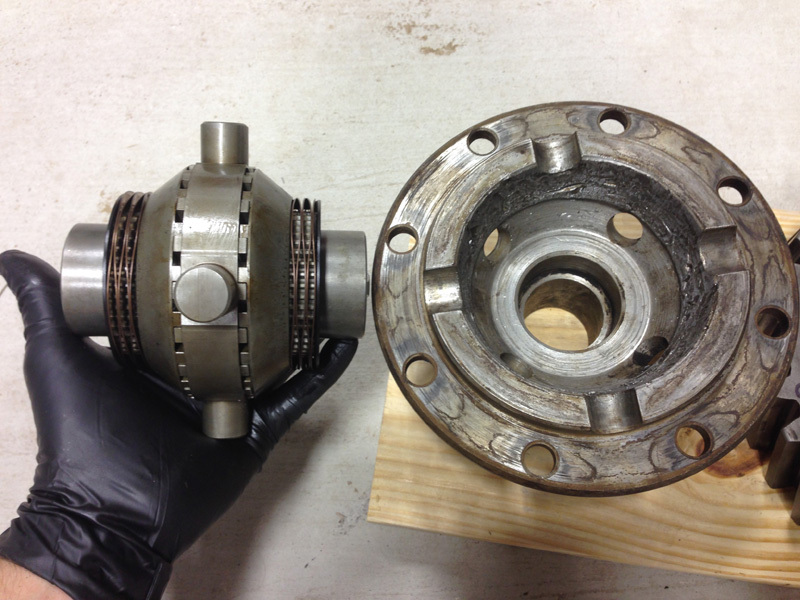 20) Reinstall the differential assembly into its housing. Verify your alignment marks! Everything goes back where it came from. 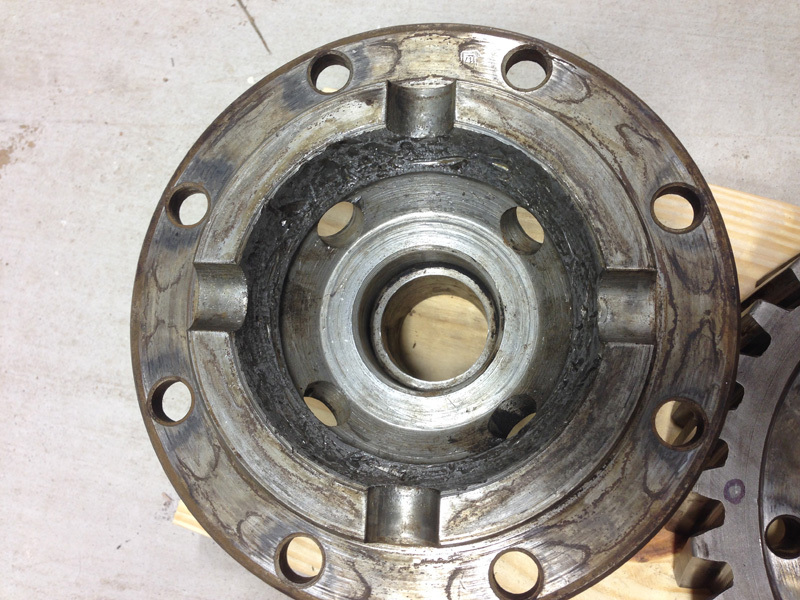 Make sure to slide on the corresponding bearing retainer on the appropriate bearing beforehand. 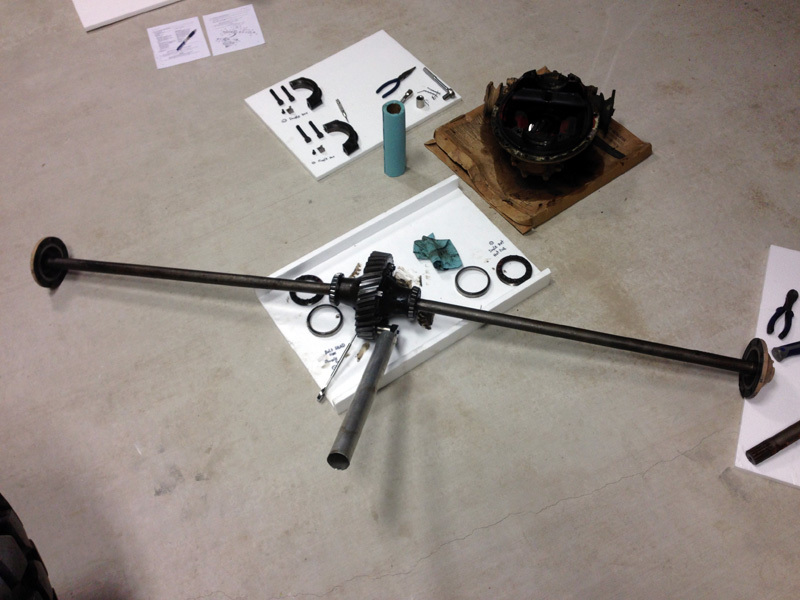 21) Continue following the TM for reassembly. 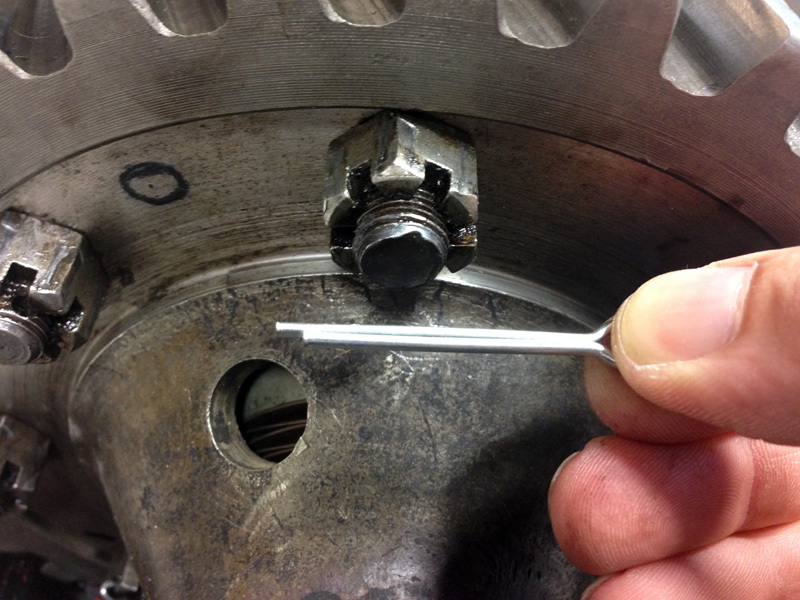 Before fully tightening the side adjusting nuts take a look at my video below. 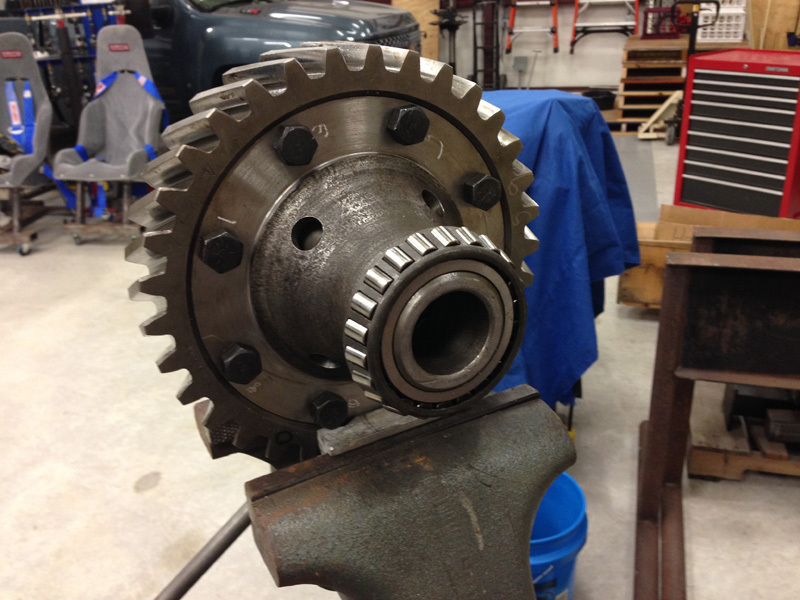 You want to make sure the gears are meshing in alignment like they were before. 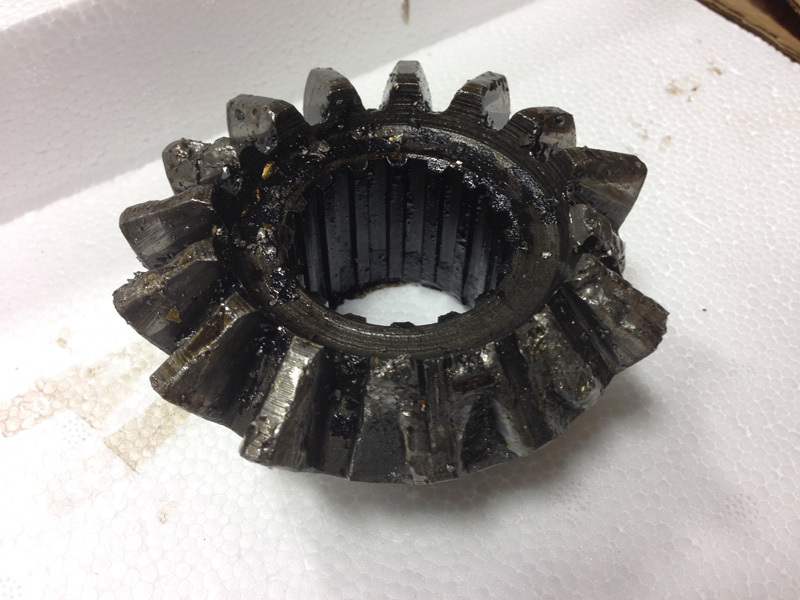 If you shine a light into the differential housing you can see the wear pattern on the bottom (bevel) gear and the bull gear. 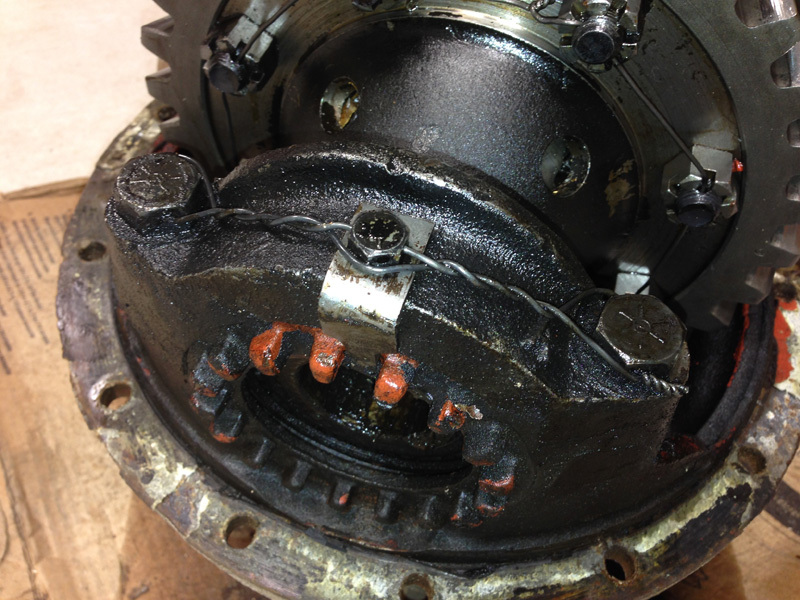 If you tighten a side adjusting nut it will push the entire differential assembly away from that adjusting nut. 22) If you are a millwright you will already have a magbase and dial indicator. 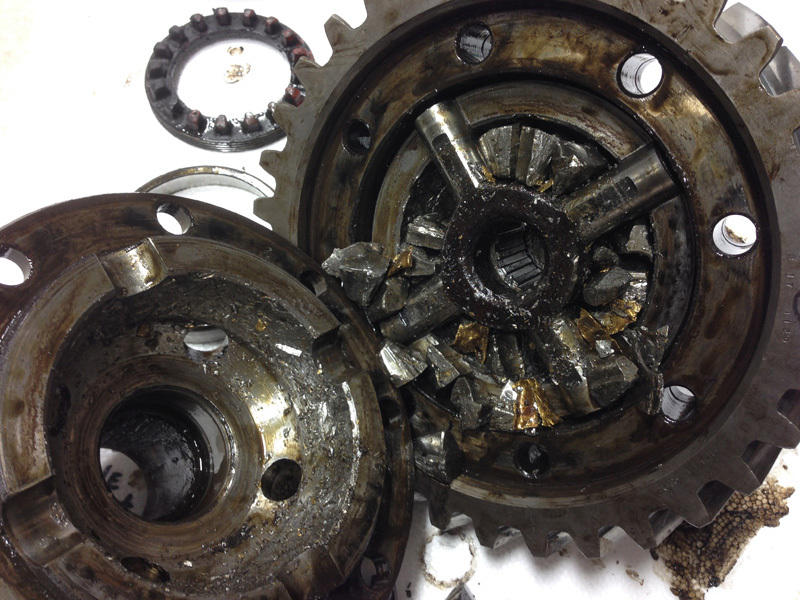 If you aren't a millwright either call one or go purchase a magbase stand and a dial indicator to set the gears correctly. 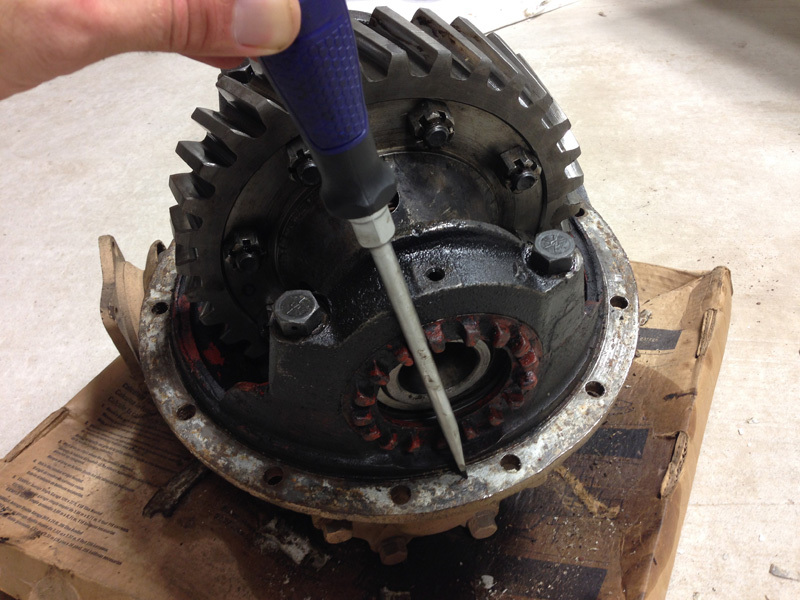 23) Set the magbase on the differential housing flange and tighten the dial indicator so that the pointer is mid length on its stroke while touching the flat side of the bull gear. See the pictures and TM photos for more information. 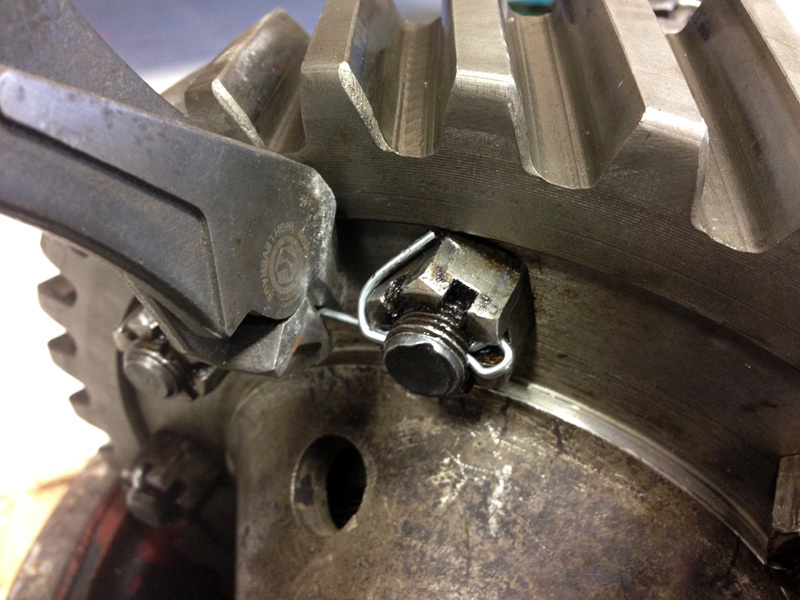 24) Follow the TM (page 10-32) and alternately tighten the side adjusting nuts until you have 0.000" slop when you push/pull on the differential assembly in the housing. You can use your favorite prybar inside the housing, or you burly men can just grab the bull gear with one hand and the nearest bearing cap with the other. Push/pull or pry while you watch the dial indicator. Again, 0.000" is what you are aiming for. 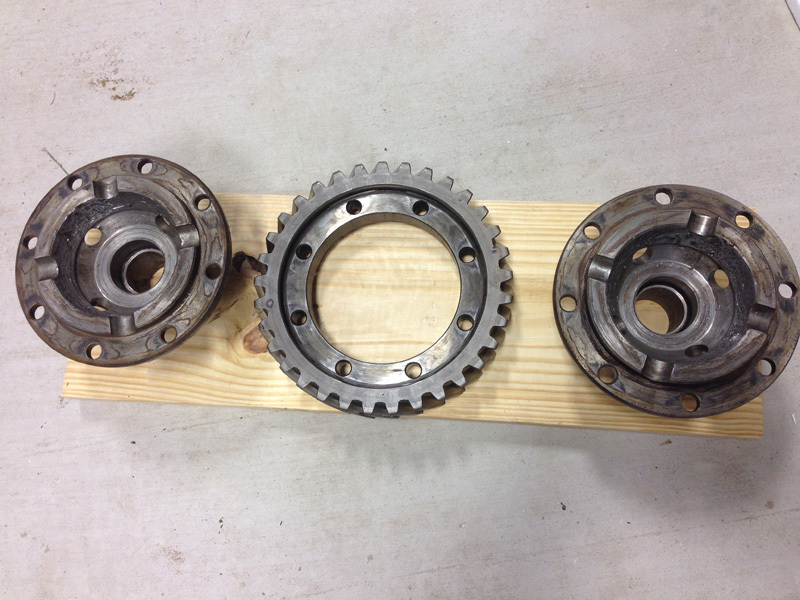 If you have more than that continue to alternately tighten each side adjusting nut. 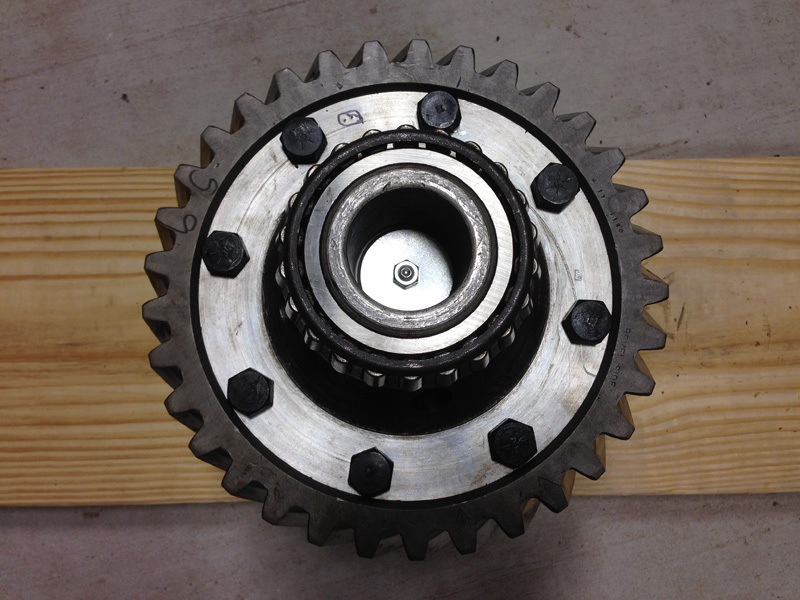 25) Once you get 0.000" side/side play on the bull gear start rotating the bull gear in one direction and watch the dial indicator for checking runout. 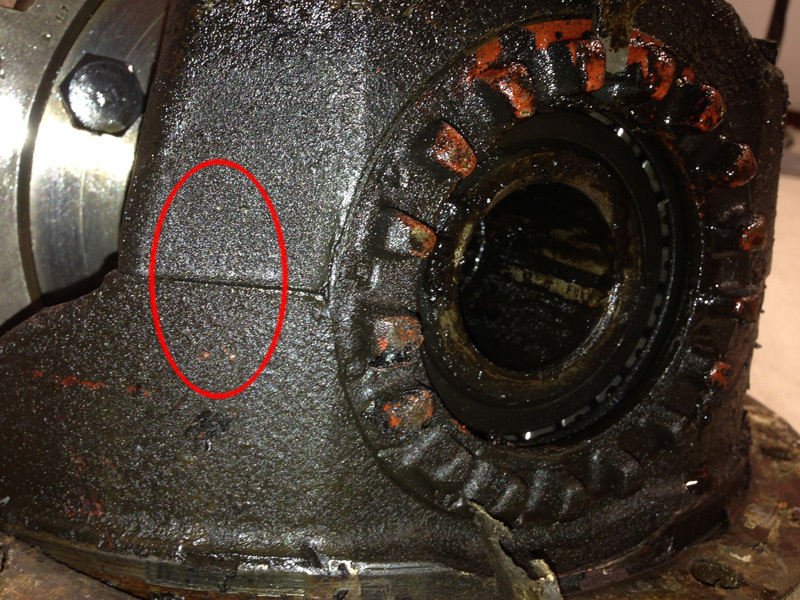 If the side of the bull gear has less than 0.008" runout you don't have to replace it. Thank the good Lord and go to the next step. 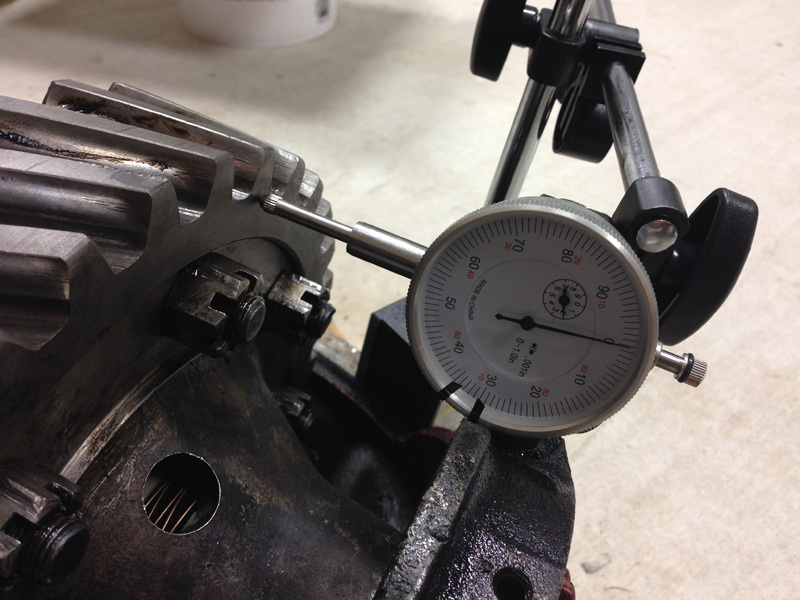 I had 0.004" max runout on the bull gear. 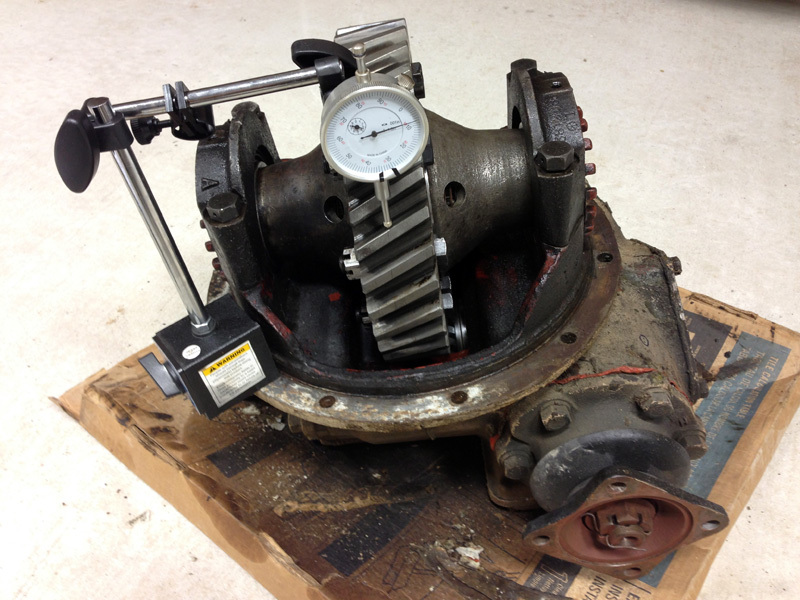 26) Move the magbase and dial indicator into the position shown in the picture and TM to check the backlash of the bull gear. 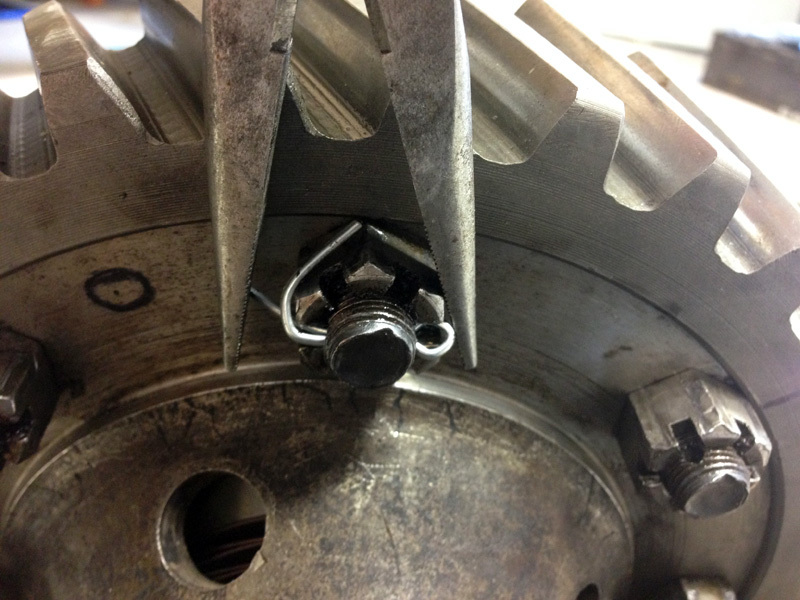 Rock the bull gear back and forth with the dial indicator in the center of one tooth. You are aiming for 0.007-0.014". If you pass this test again thank the good Lord. Otherwise you have to replace parts. I had 0.012" backlash. 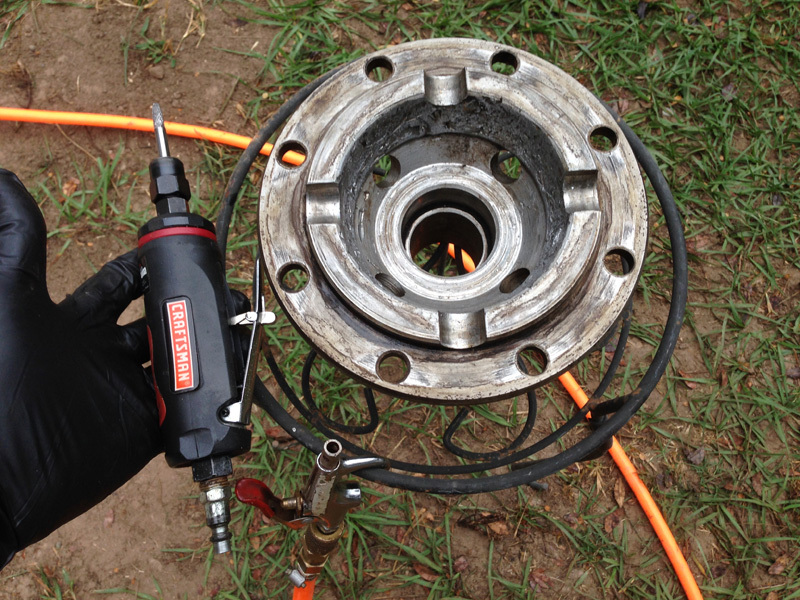 27) At this point you have to finally tighten the (4) bearing cap bolts and (2) set screws on the locking tabs. Next, safety wire the (8) bull gear bolts as well as the (4) bearing cap bolts and the set screws attached to the side adjusting nut locking tabs. 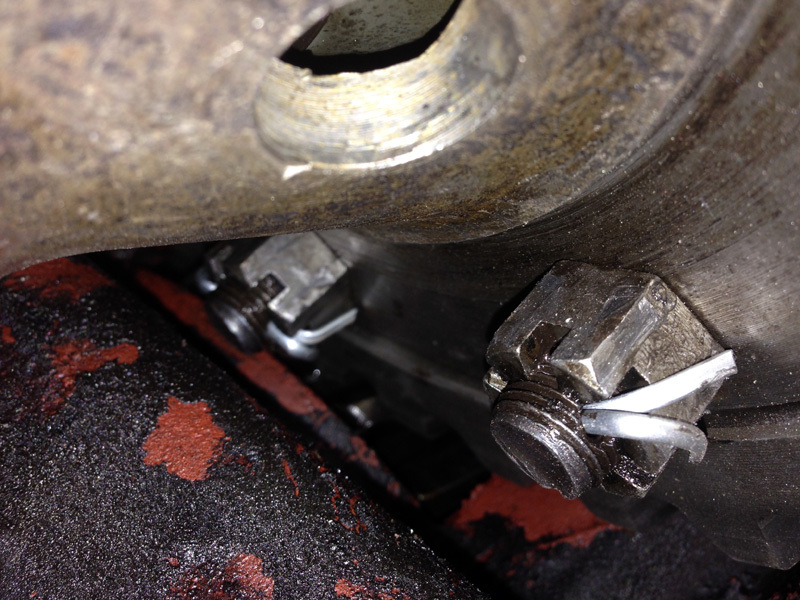 I decided against safety wire on the ring gear nuts due to internal clearance issues with the differential housing. 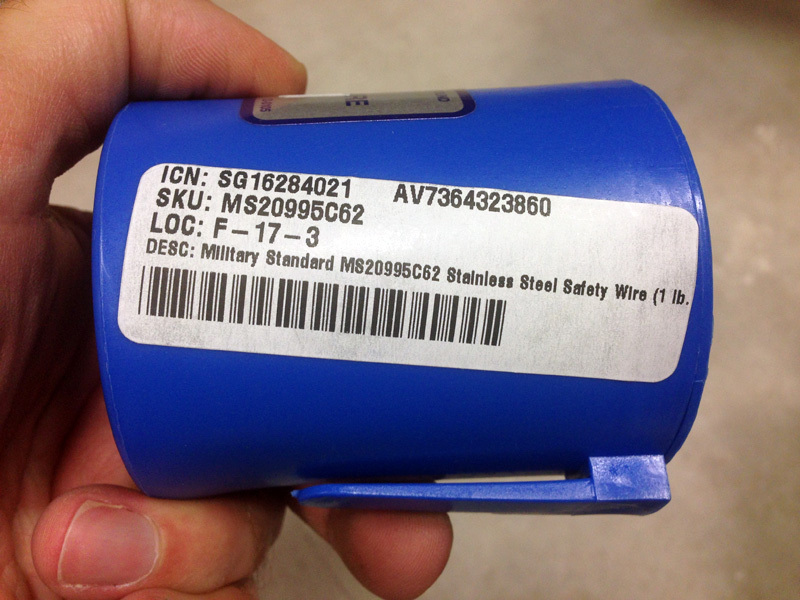 Any place that I tried to tuck the twisted end of the safety wire scraped on the inside of the housing. 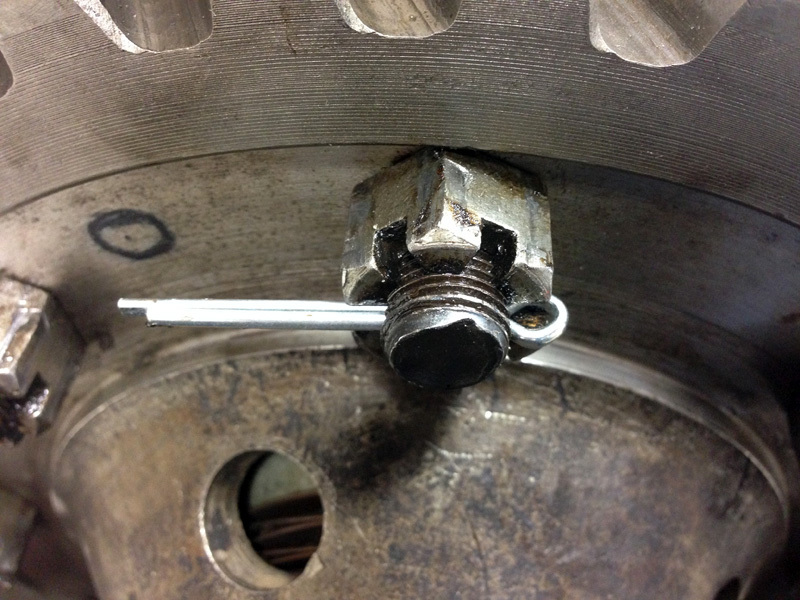 Cotter pins installed properly should provide just as much protection. 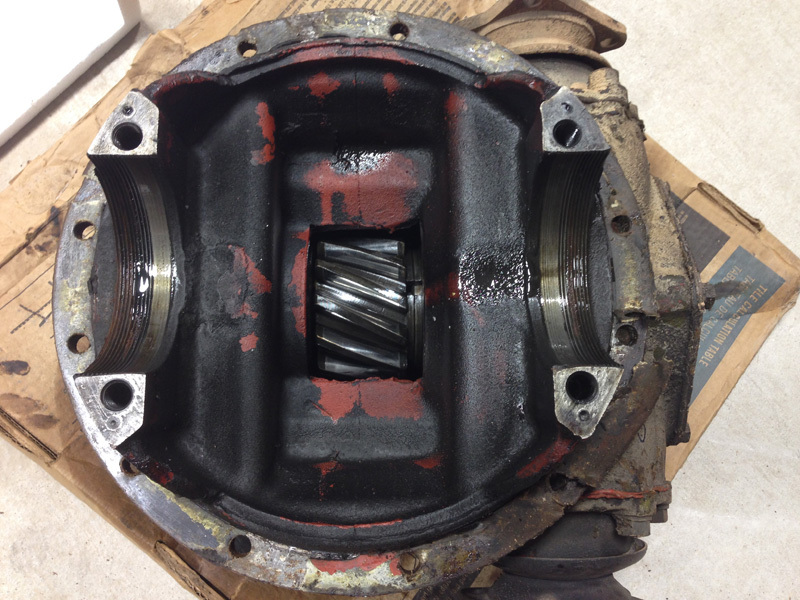 28) Lastly, replace the differential housing into the axle housing. 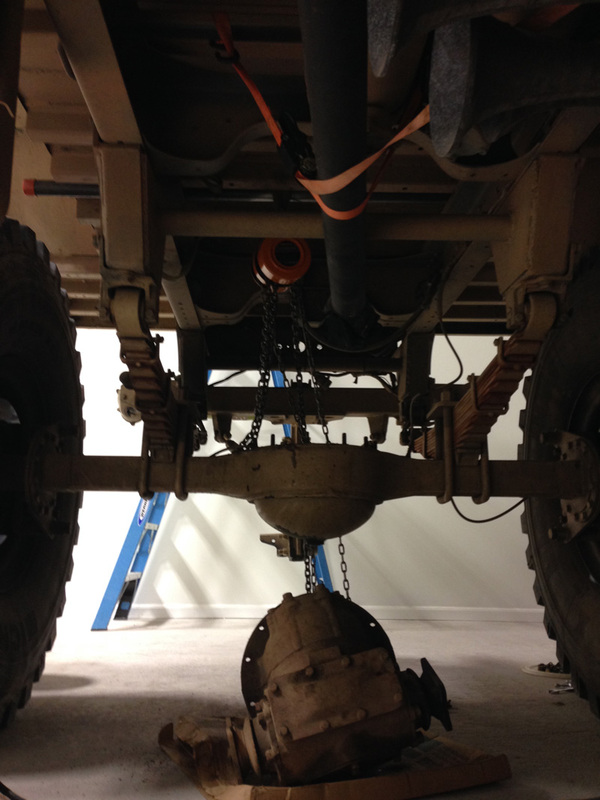 Follow the steps in reverse to put your axles back in, fill with fluid, etc. Enjoy your new Ouverson Locker!